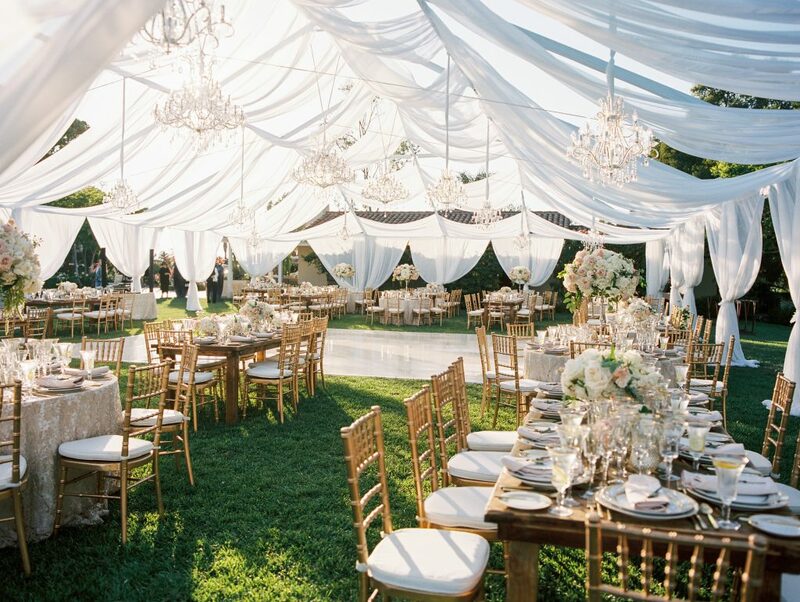 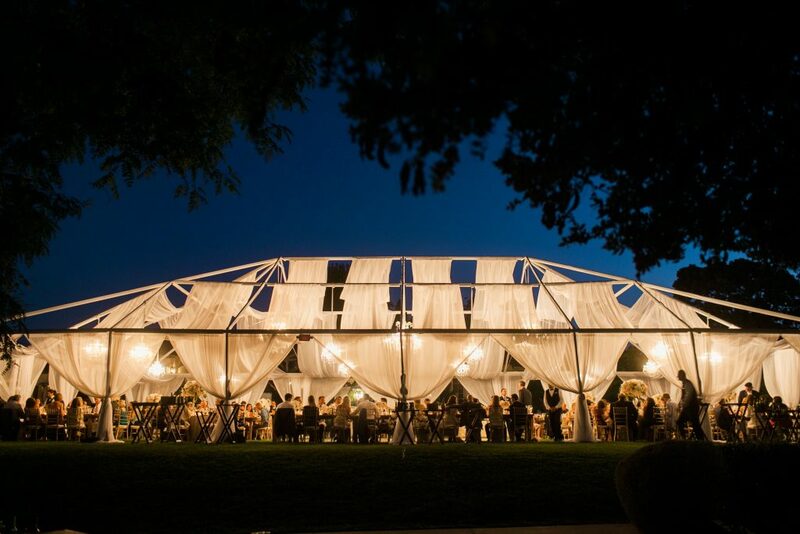 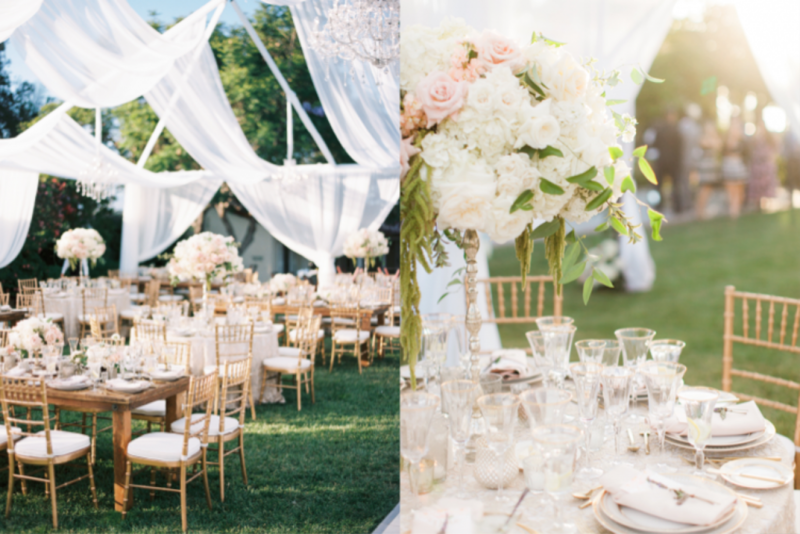 If you’re dreaming of a soft, whimsical, blush and cream open-air tented wedding, prepare to be INSPIRED! 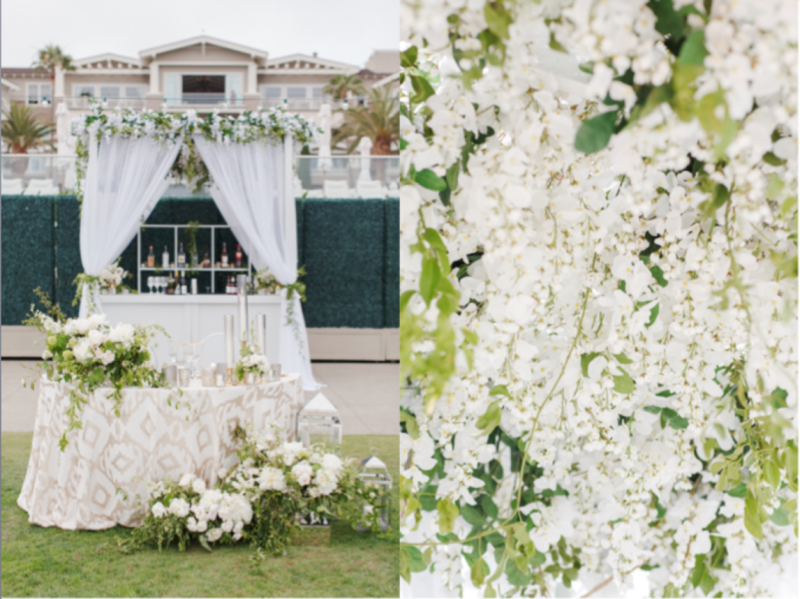 The outstanding coordination & design team at Couture Events spared no detail when creating this traditional, garden beauty! 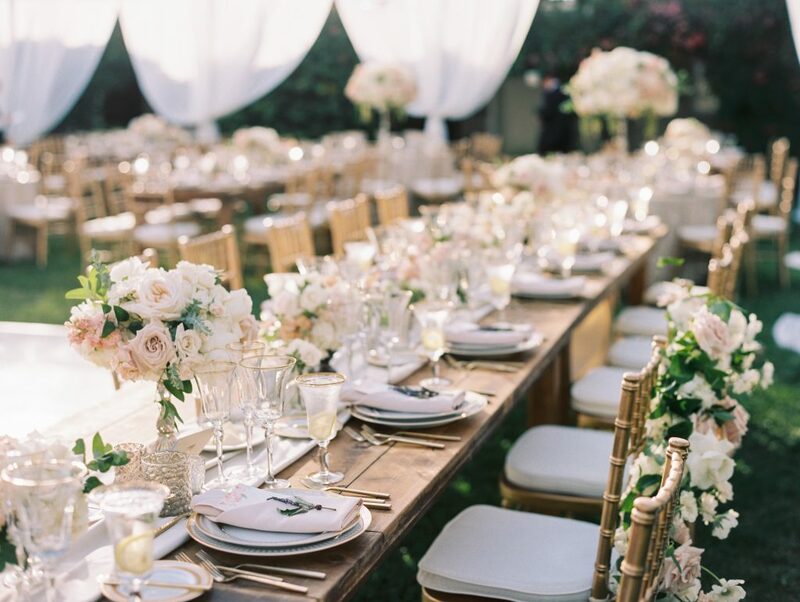 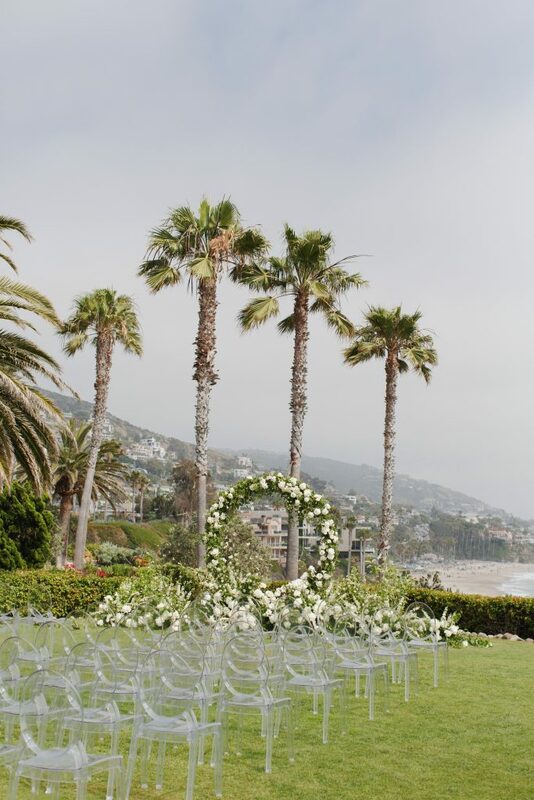 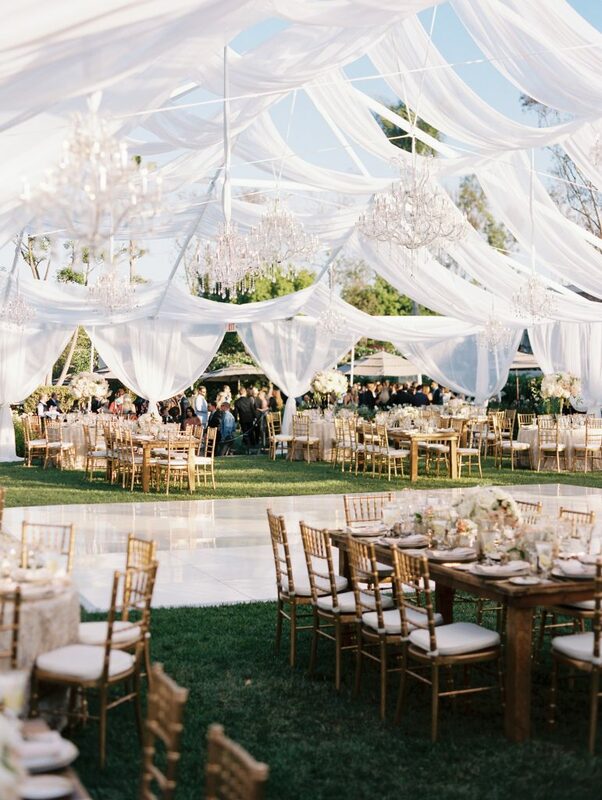 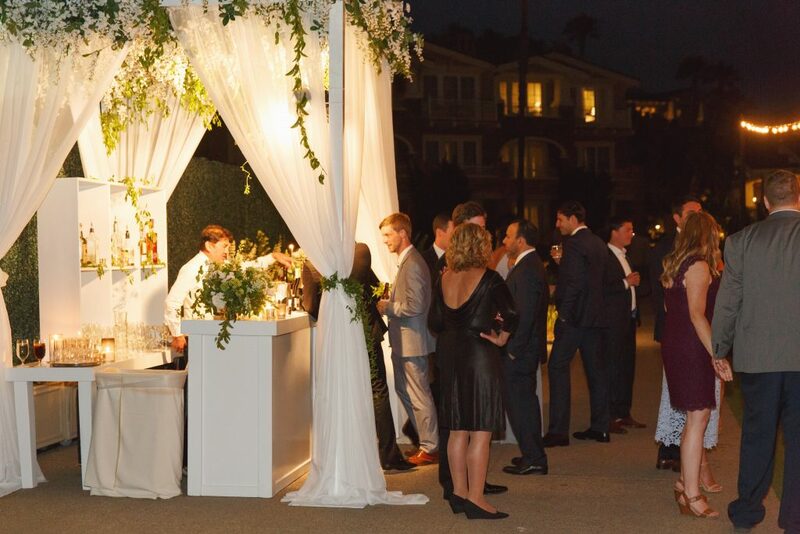 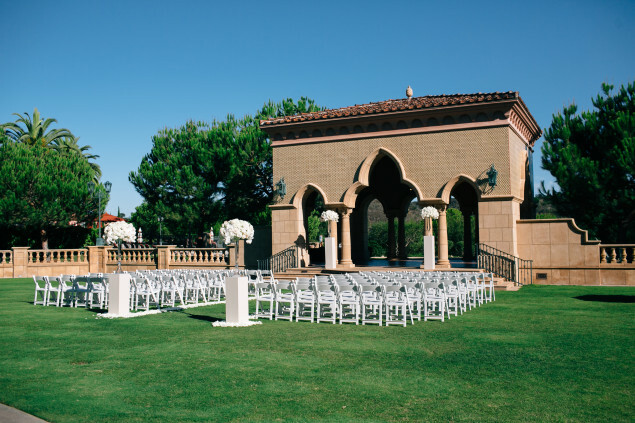 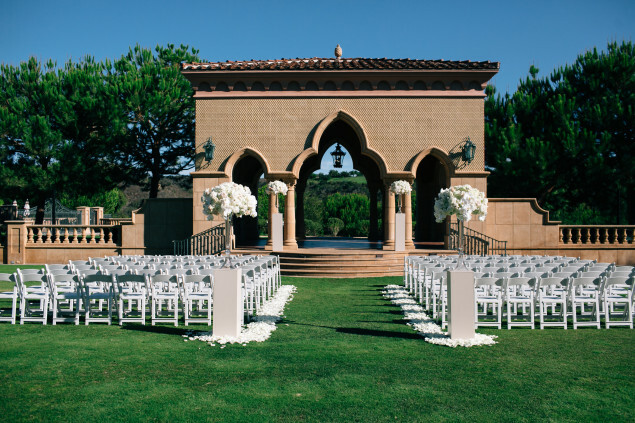 Set along the beautiful, lush grounds of the Inn at Rancho Santa Fe, the event aesthetic blended perfectly with its soft backdrop. 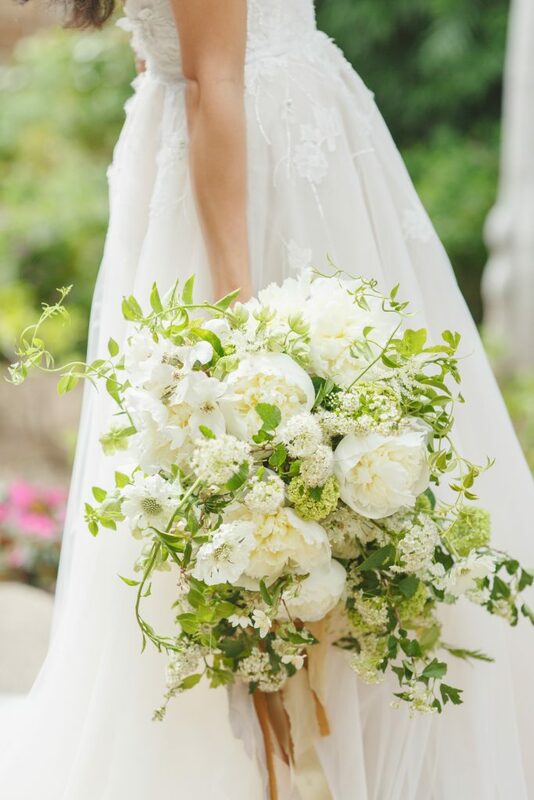 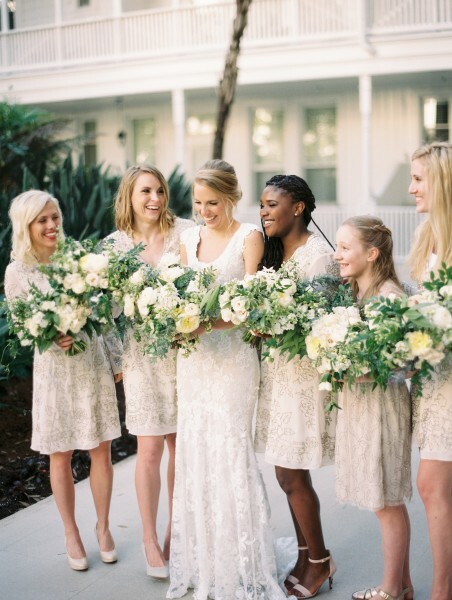 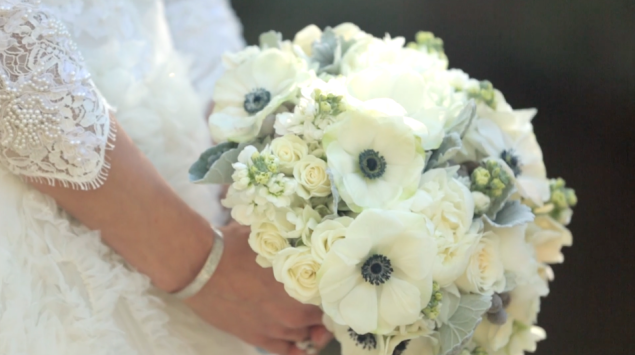 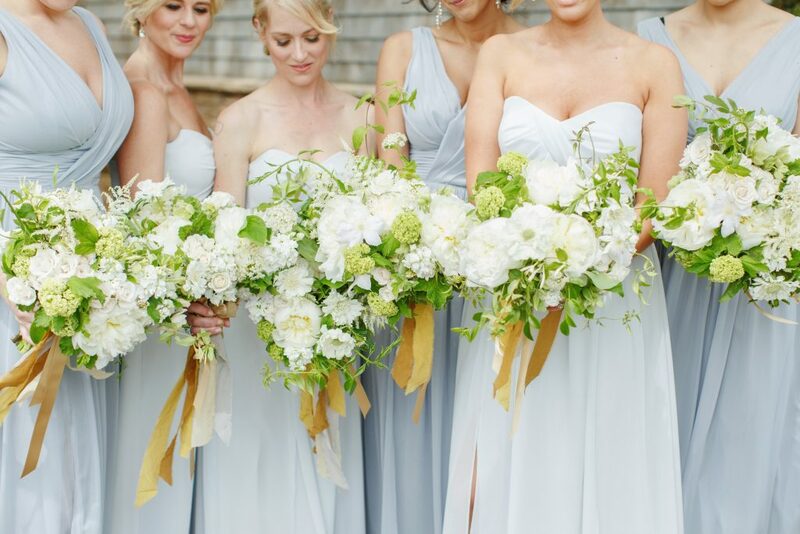 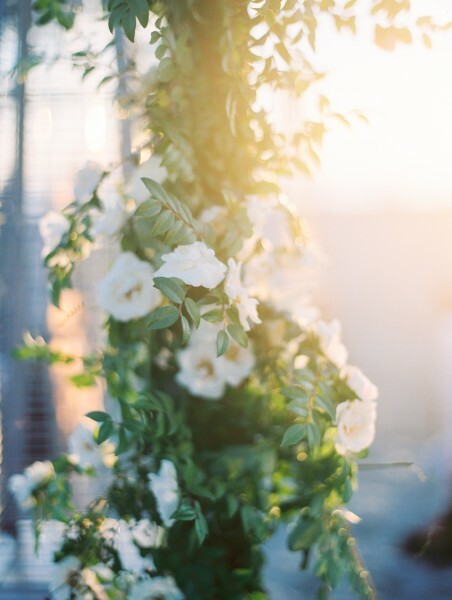 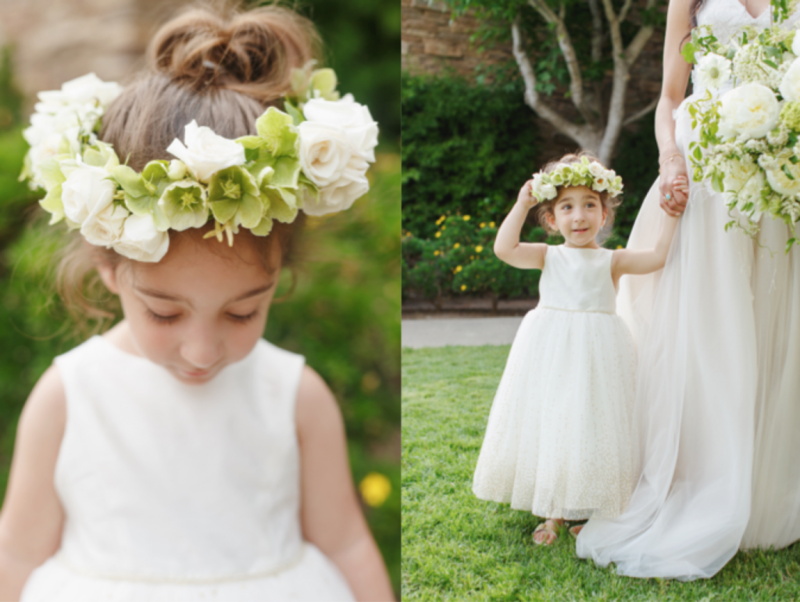 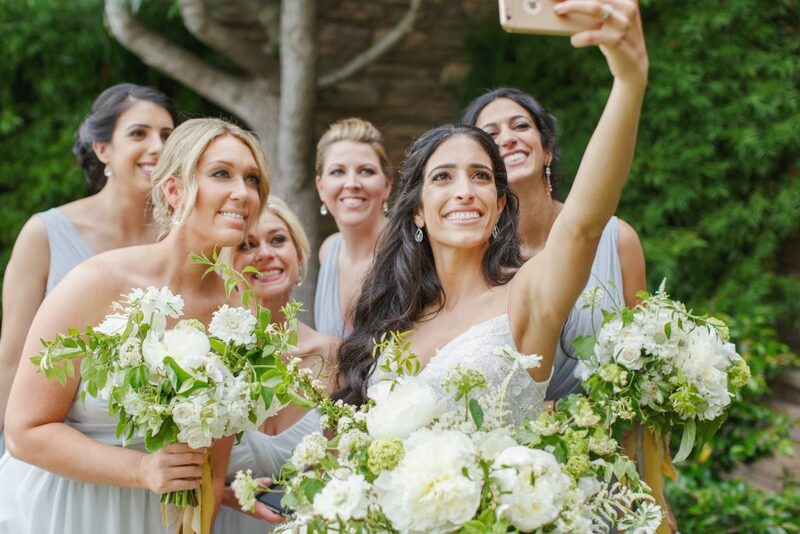 The bride and her ladies carried fluffy, white and cream bouquets of soft garden blooms. 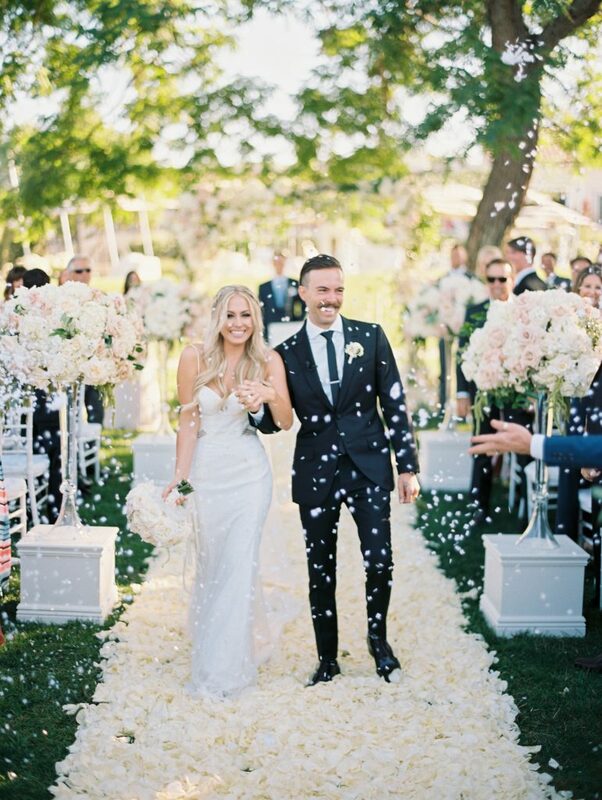 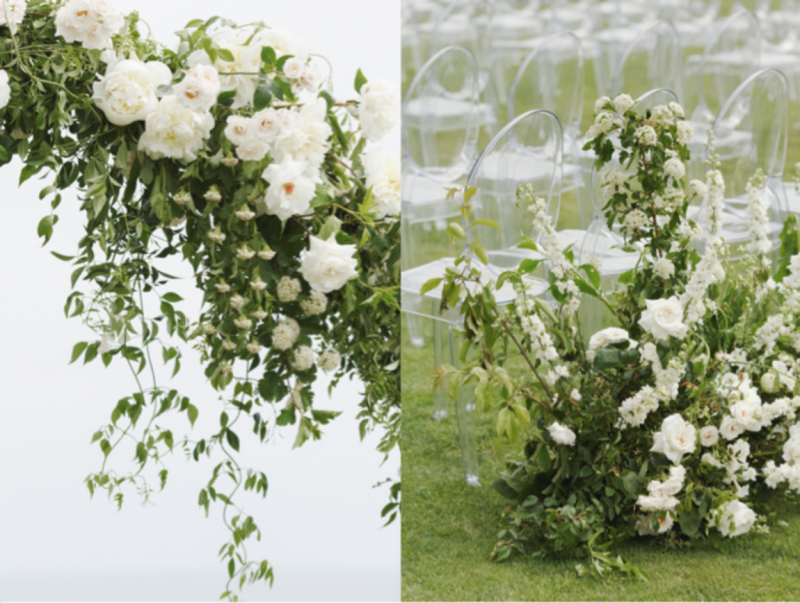 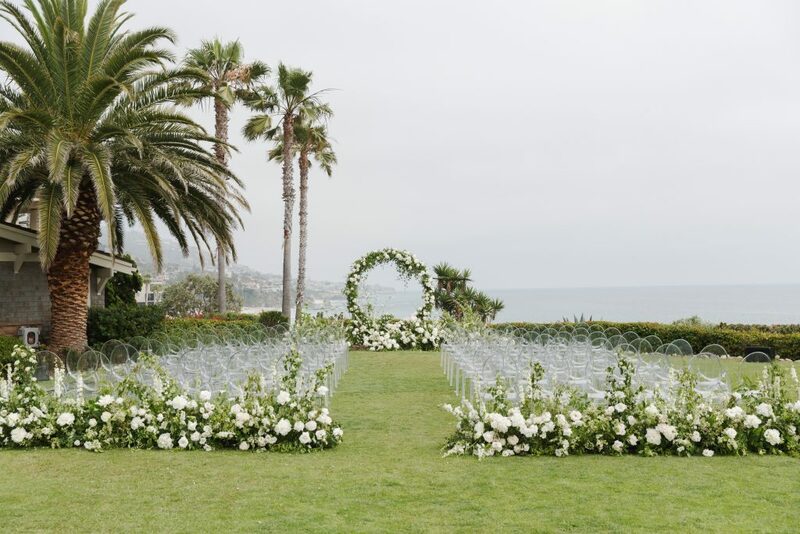 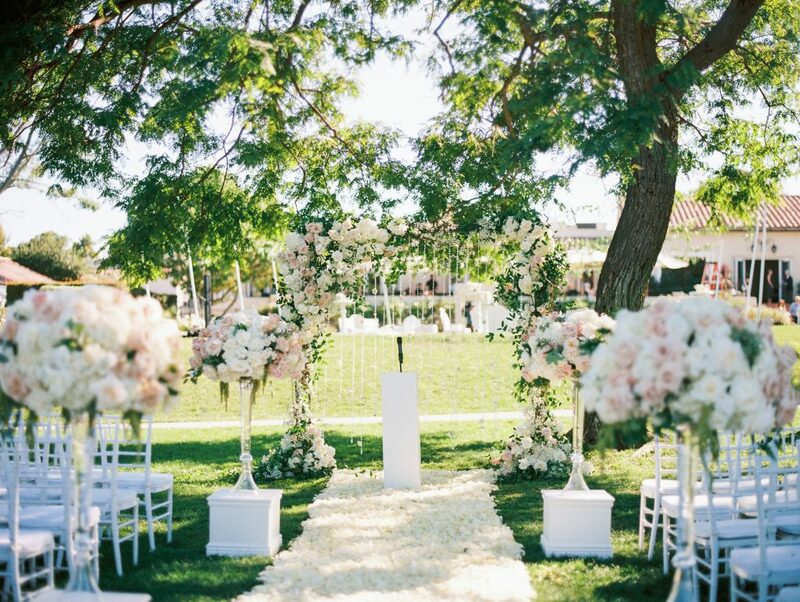 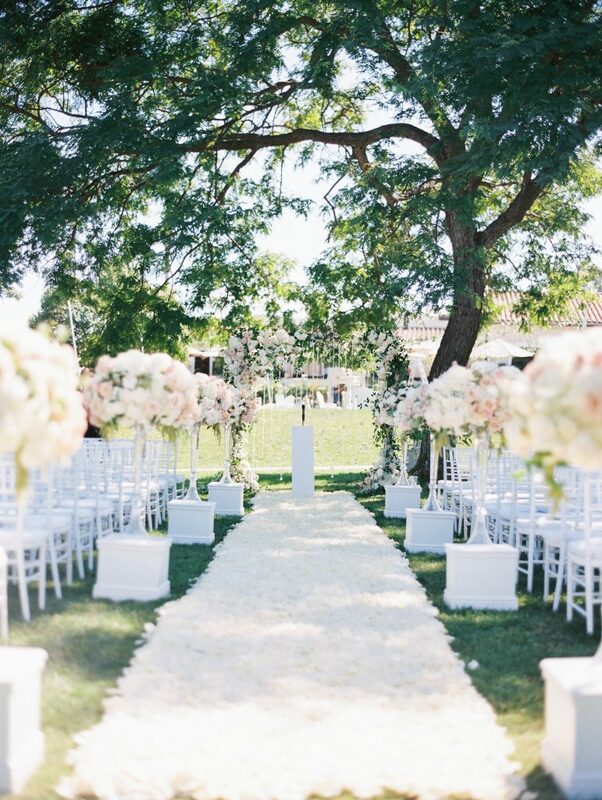 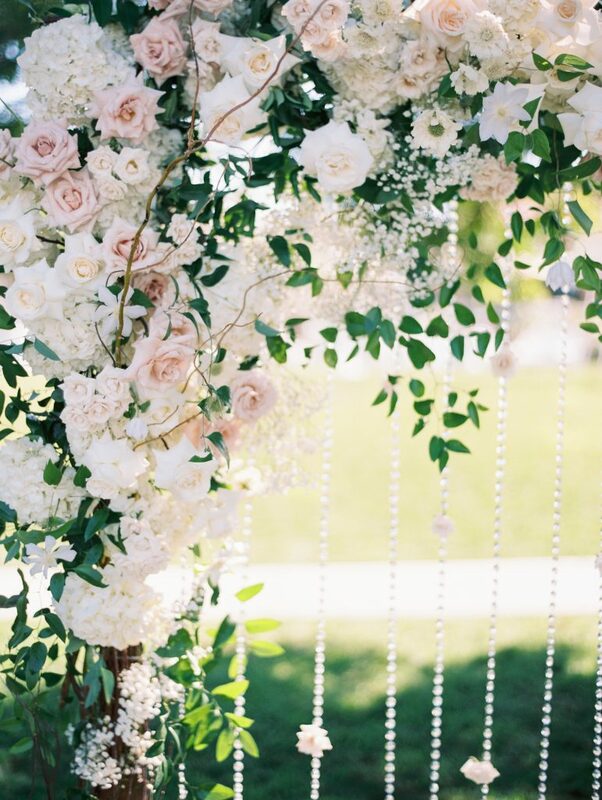 Over 2000 white roses were petaled to create this dense aisle. 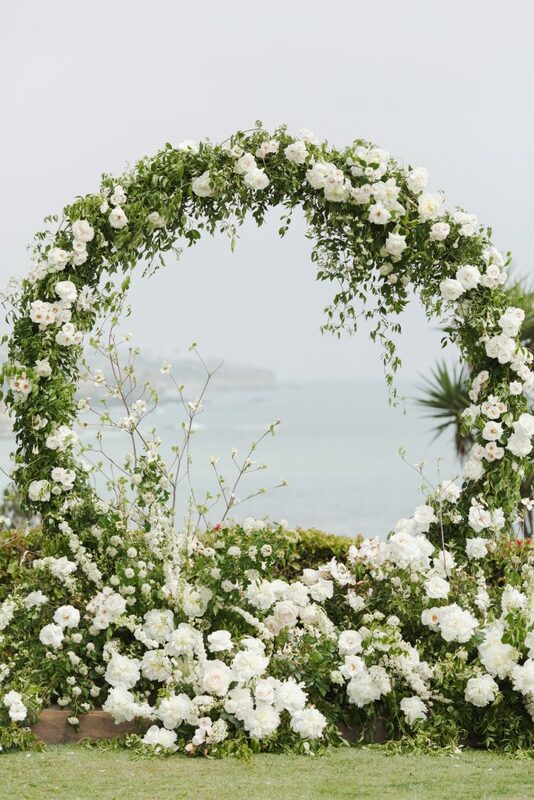 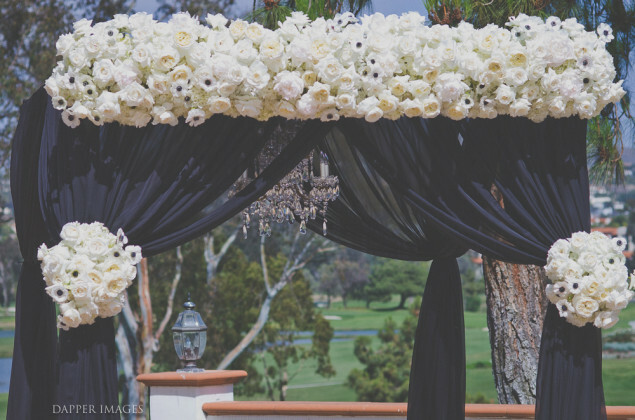 Tall, textured floral arrangements were placed atop custom ivory platforms to line the sides of the aisle leading to the stunningly detailed floral archway. 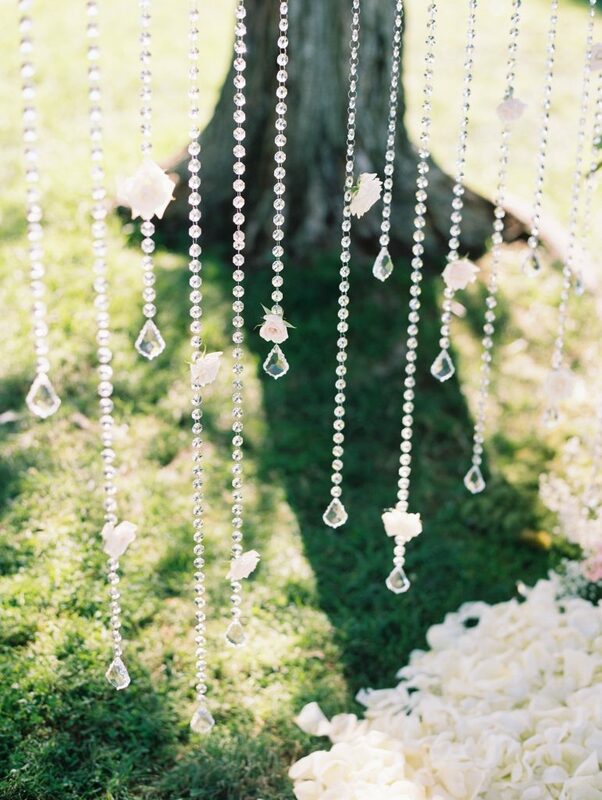 Delicate, whimsical vines naturally cascaded from the archway to compliment glittering, crystal strands. 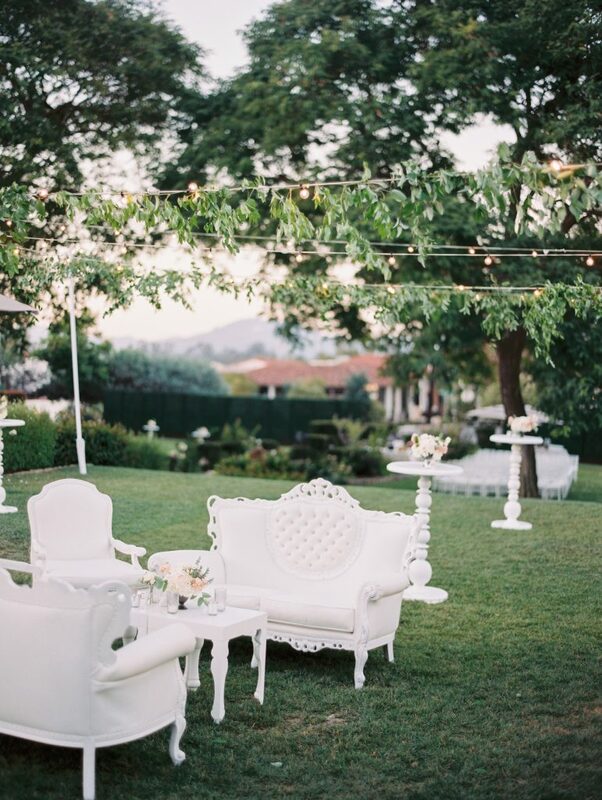 The cocktail hour boasted eclectic vintage furnishings with floating vines placed above head. 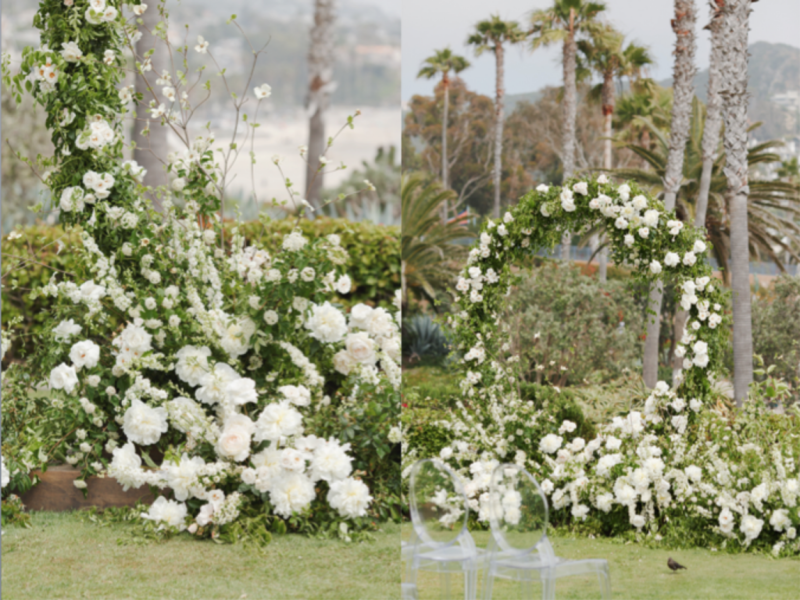 A lush floral wall was placed as a photo backdrop. 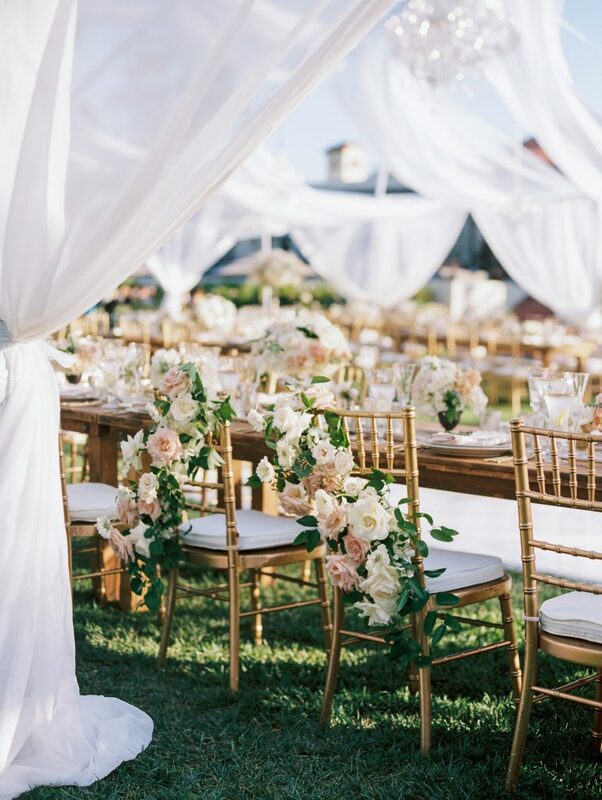 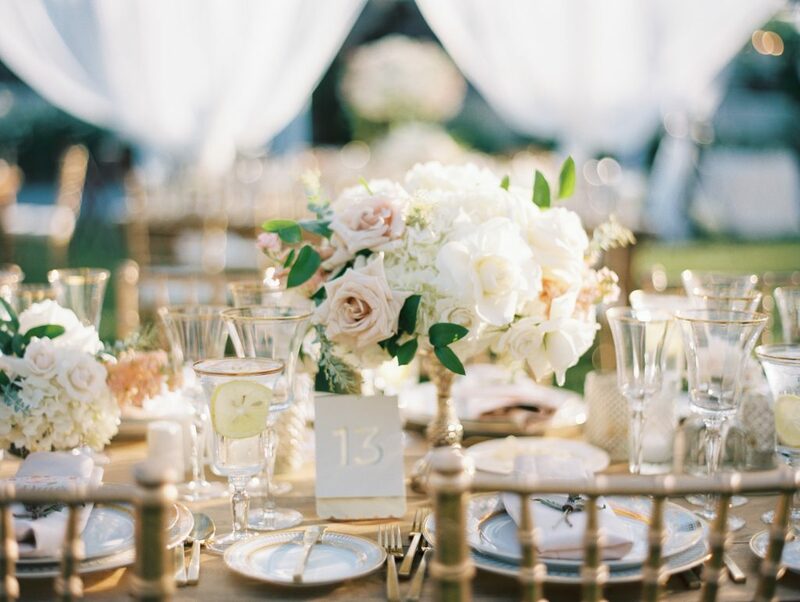 The open tent reception was the perfect mix of traditional, vintage and garden, pairing wood tables with gold chiavari chairs, silk runners and pairing of tall and short centerpieces in soft shades of white, blush and fresh green. 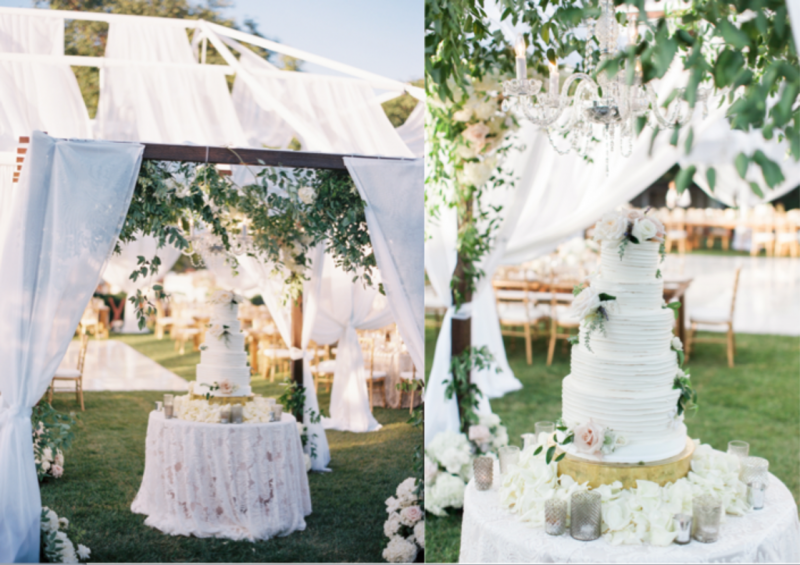 The beautiful wedding cake had it’s very own canopy placed above it, finished with a crystal chandelier and dripping vines. 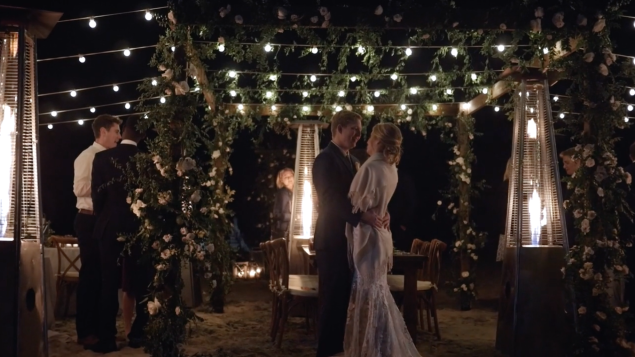 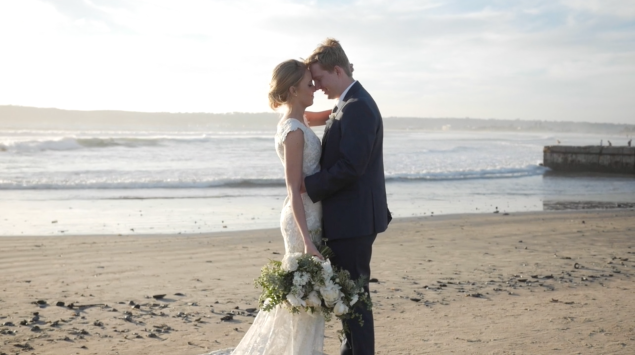 This video is pure perfection, capturing not only the love between this beautiful couple, but the beauty of that magical day. 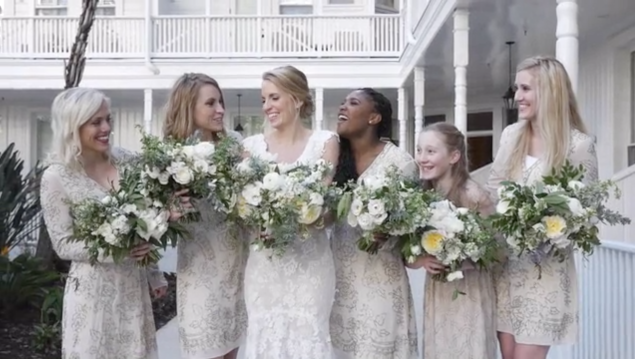 Well done Audrey Aba Films, we can’t help but blush (get it?) 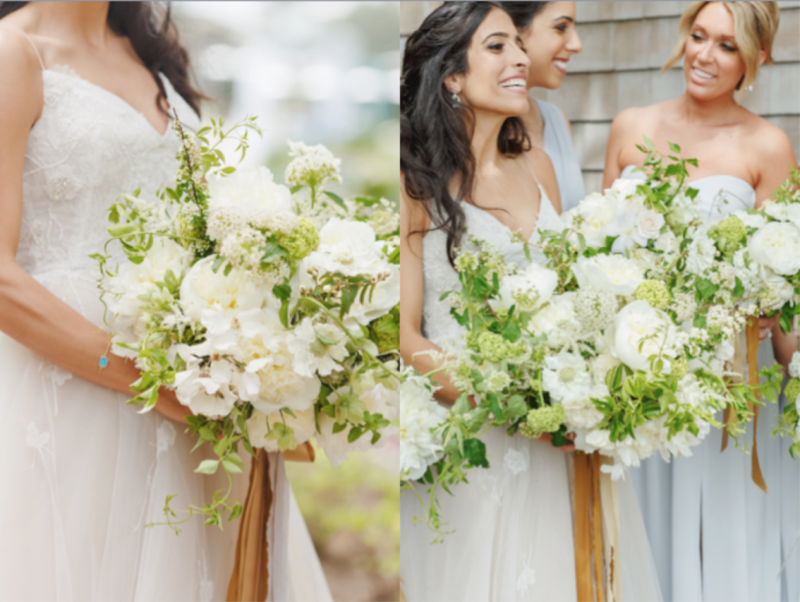 over how much love our bouquet got! 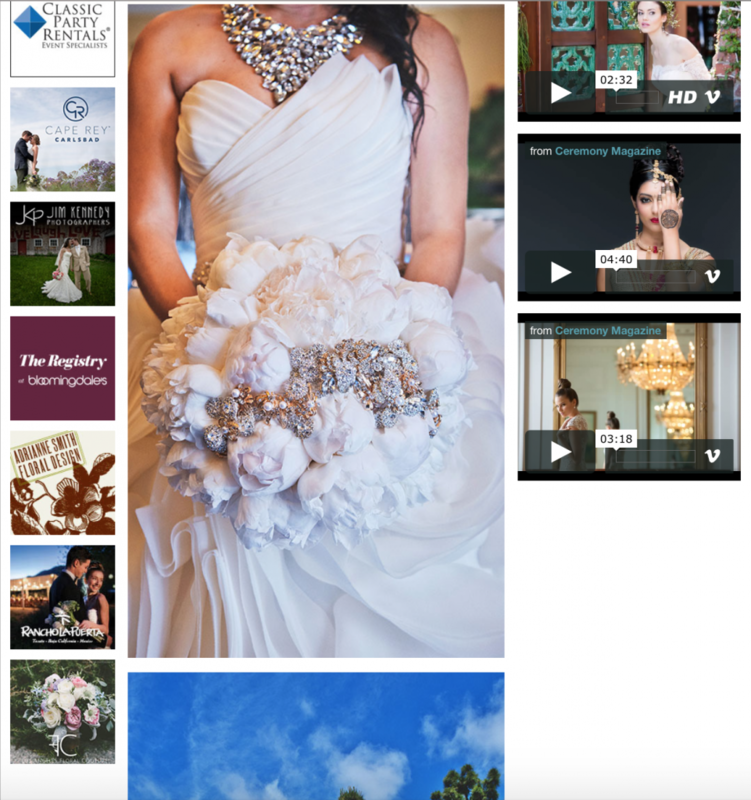 Click here or any of the images below to view the film. 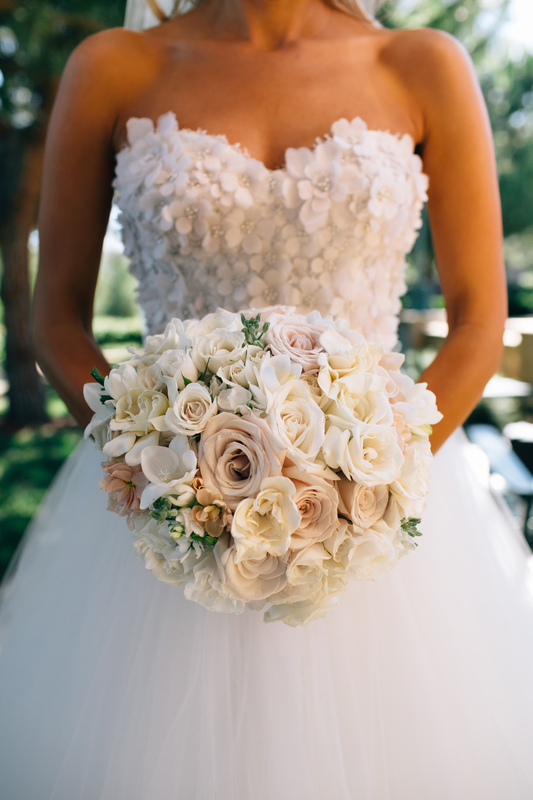 These details have stolen our heart. We are so in love with this wedding, with each detail designed, perfectly executed and planned by the incredible talent at Luxe Events and captured by the ever-so-gracious, Bryan Miller Photography. 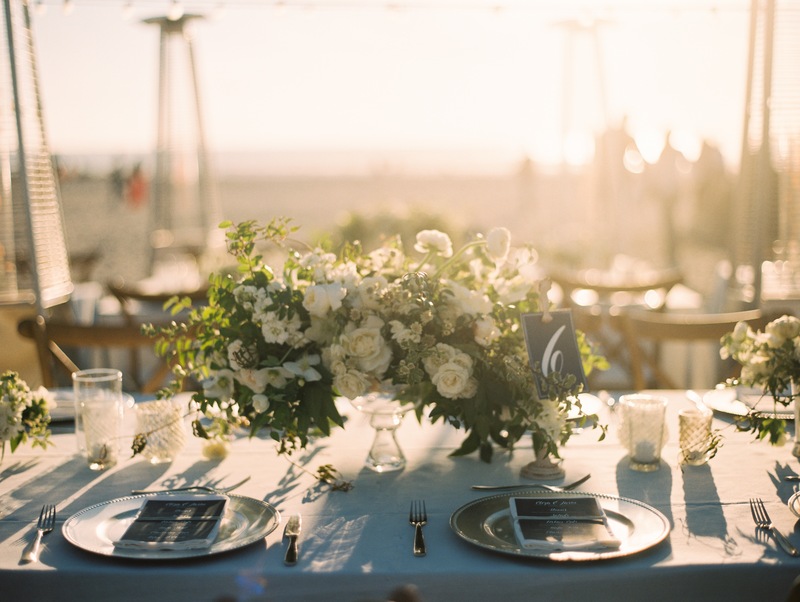 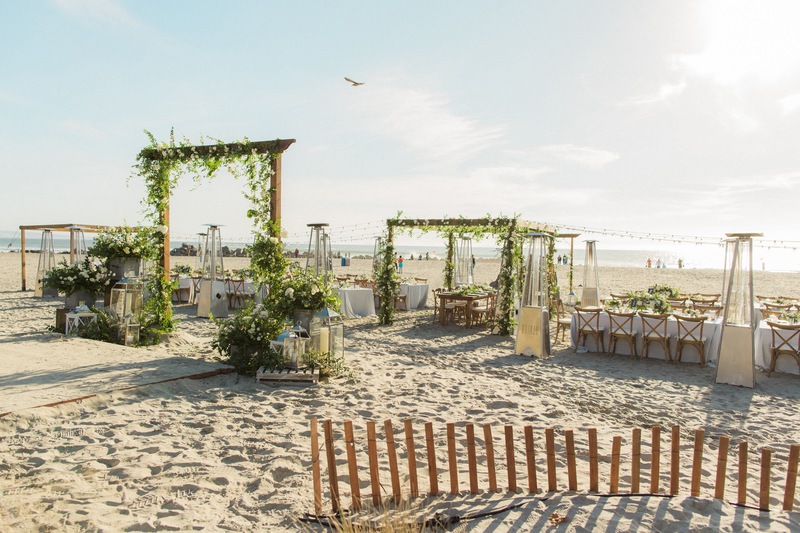 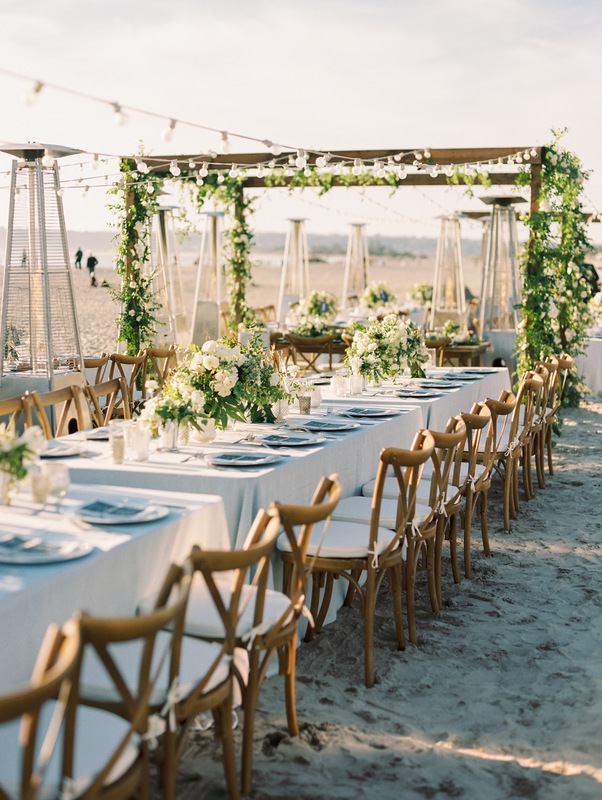 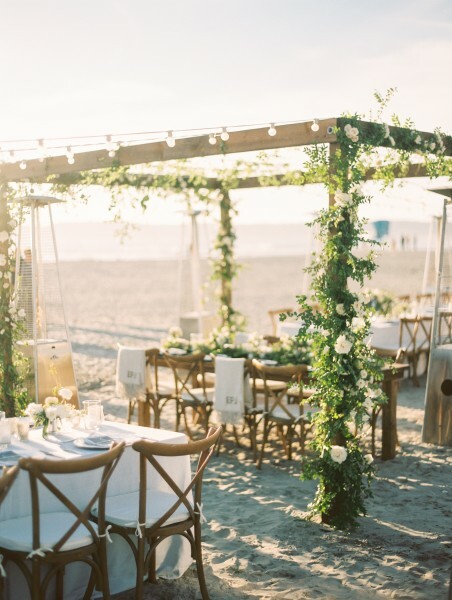 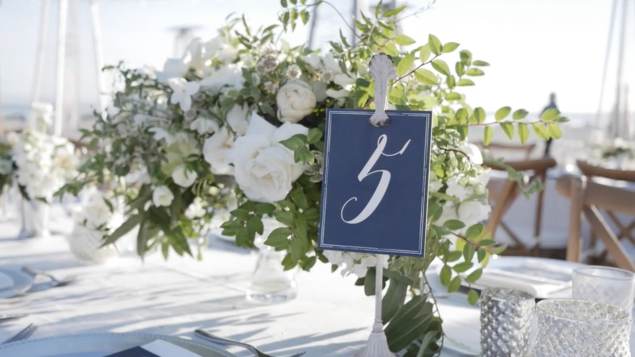 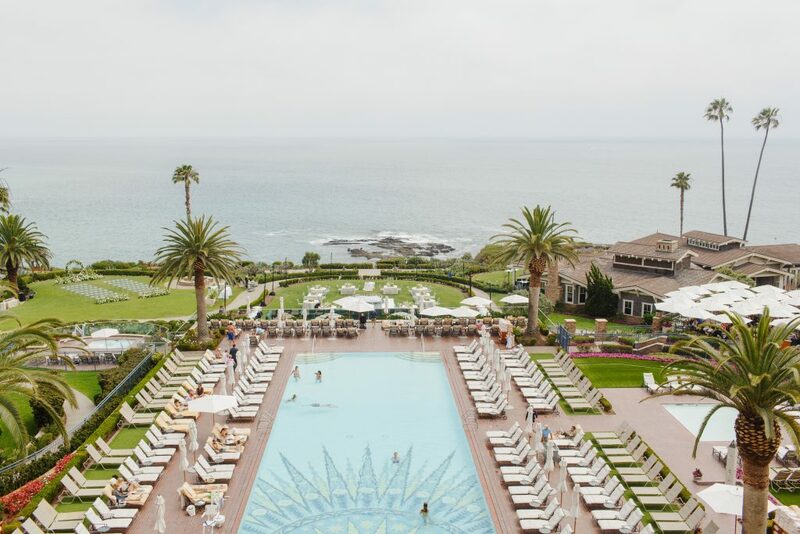 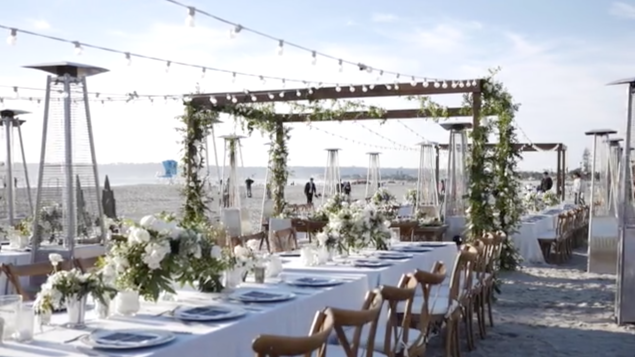 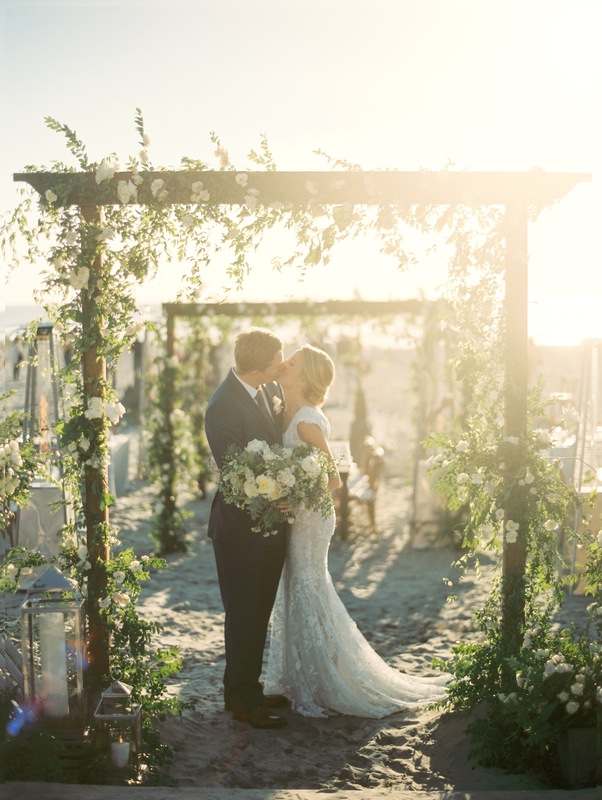 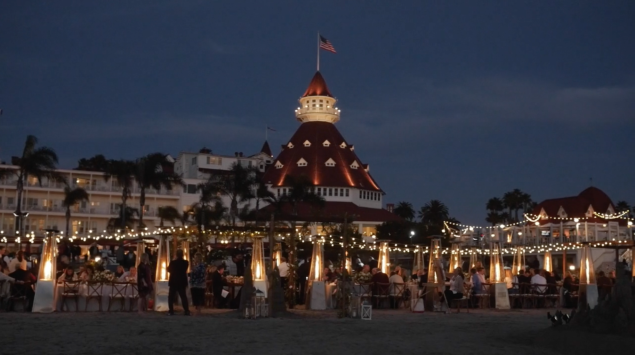 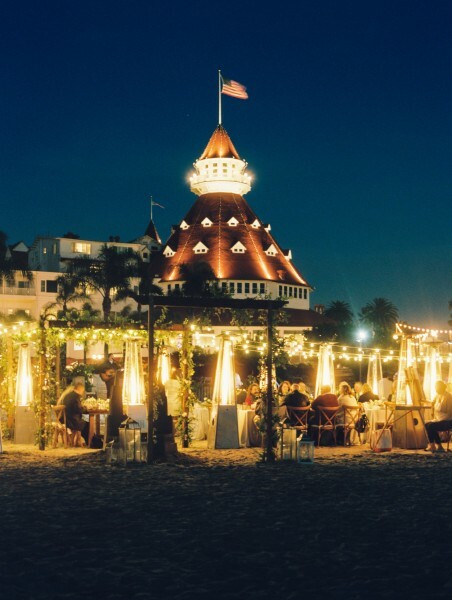 Is there anything better than a wedding set against the backdrop of the ocean at the iconic beach of the Hotel Del Coronado? We think not. 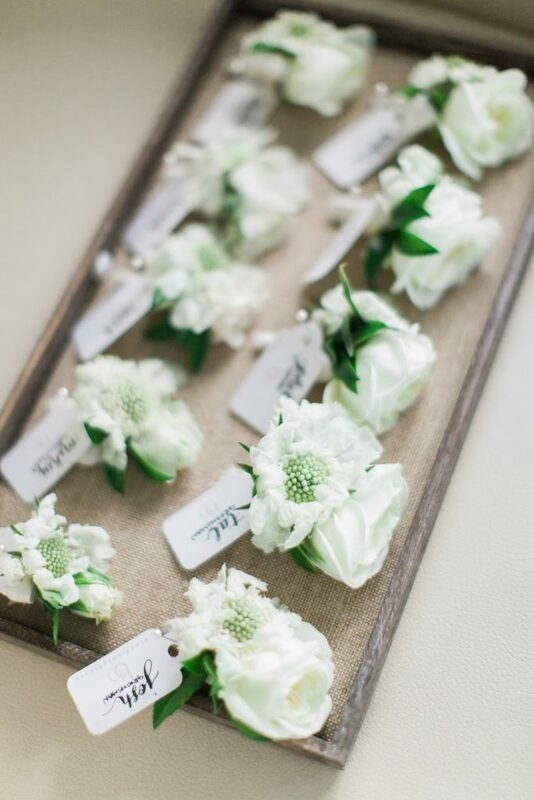 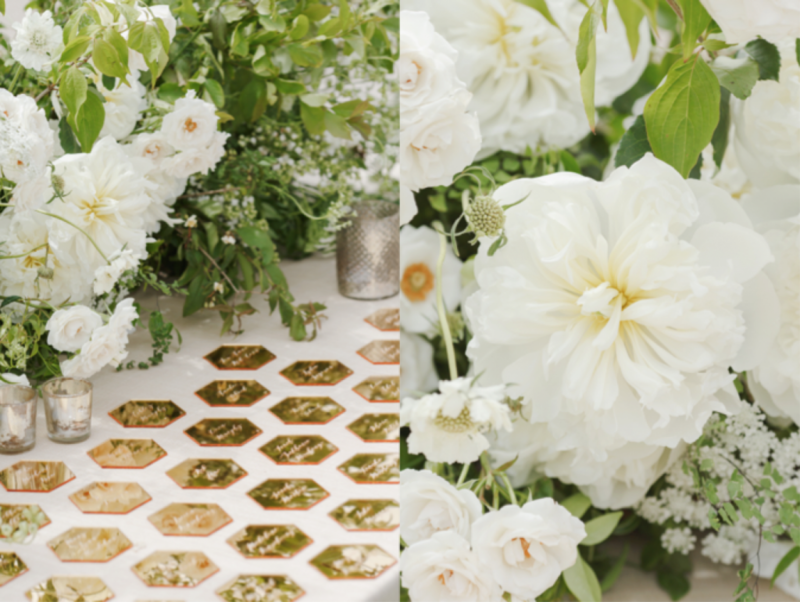 Each element of this soft cream, white and green wedding was accented by rich, textural foliage and white blooms. 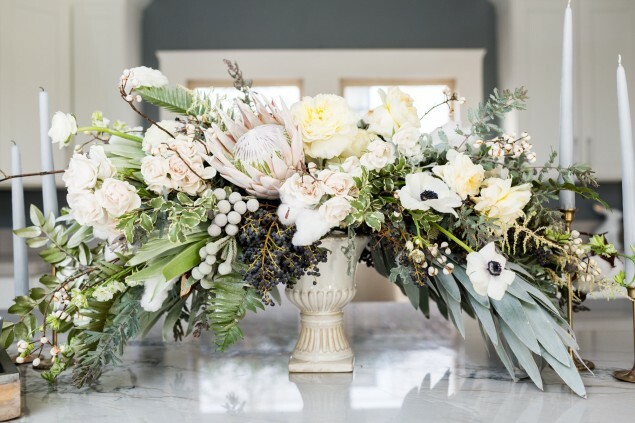 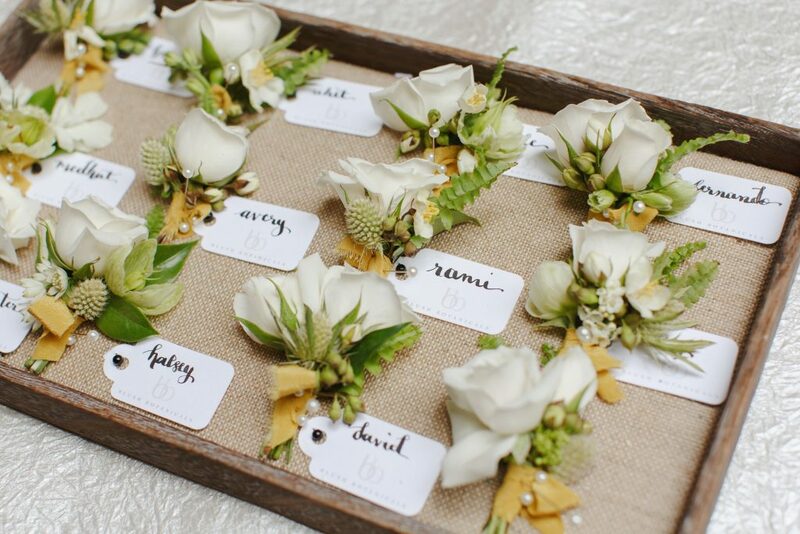 Centerpieces and bouquets overflowed with fragrant garden roses, hellebores, passion vine, ranunculus, peonies and over ten varieties of foliage throughout. 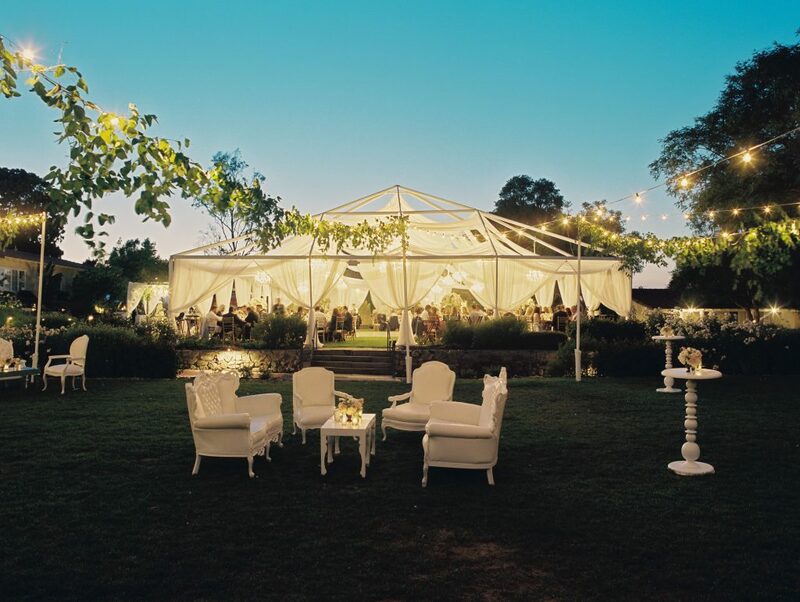 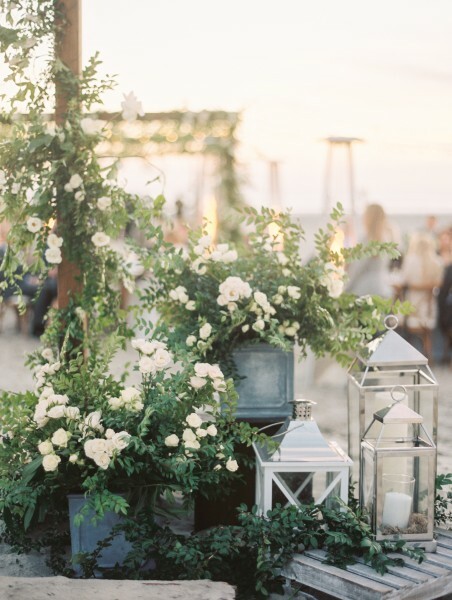 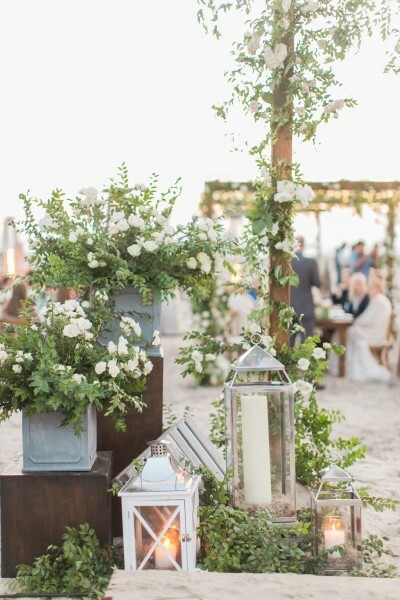 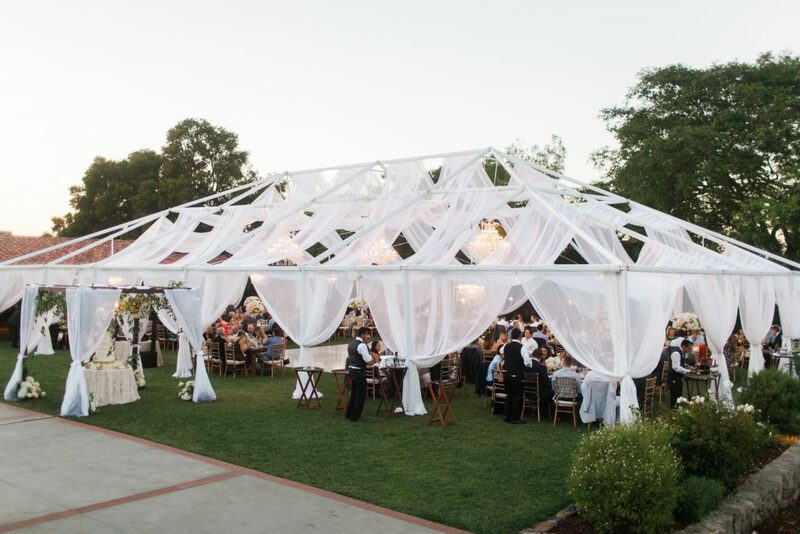 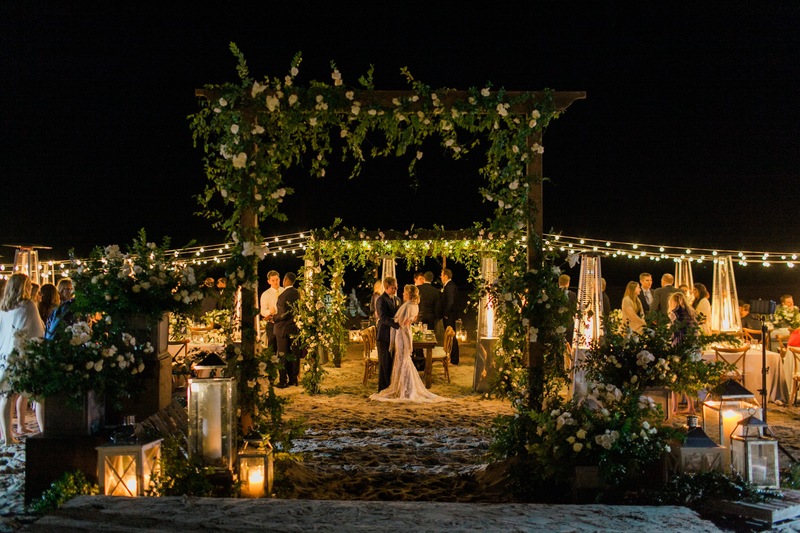 Large wood canopy structures were accented with climbing foliage and natural garden blooms, creating the soft, garden-feel and long, wood banquet tables boasted large, full arrangements and clusters of candlelight. 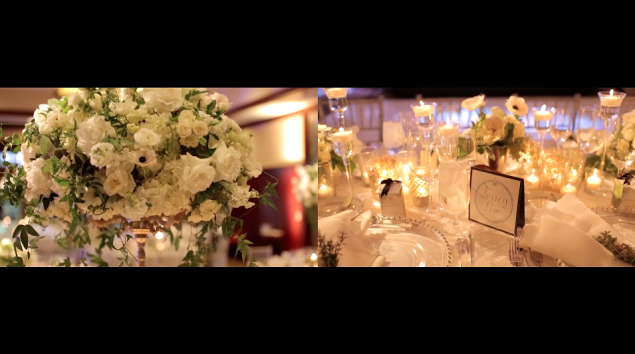 The result: pure romantic perfection, take a look! 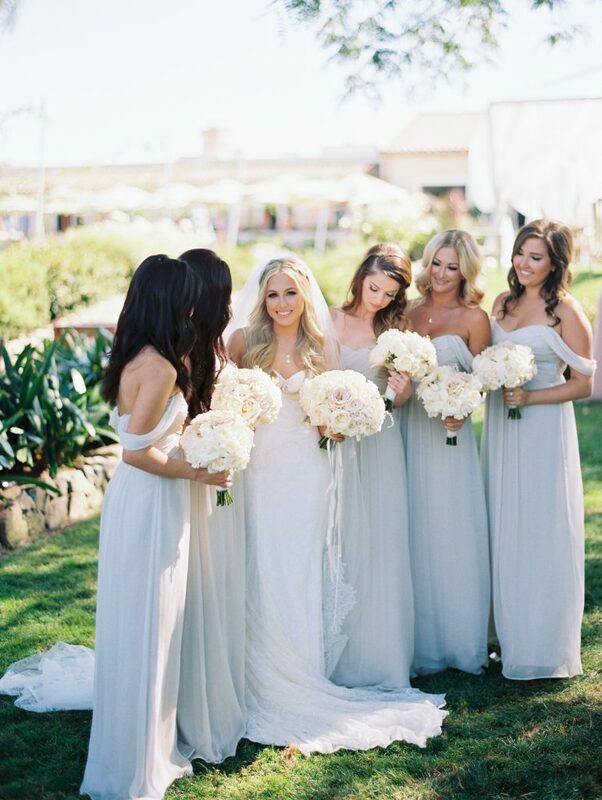 Ready… Set… SWOON! 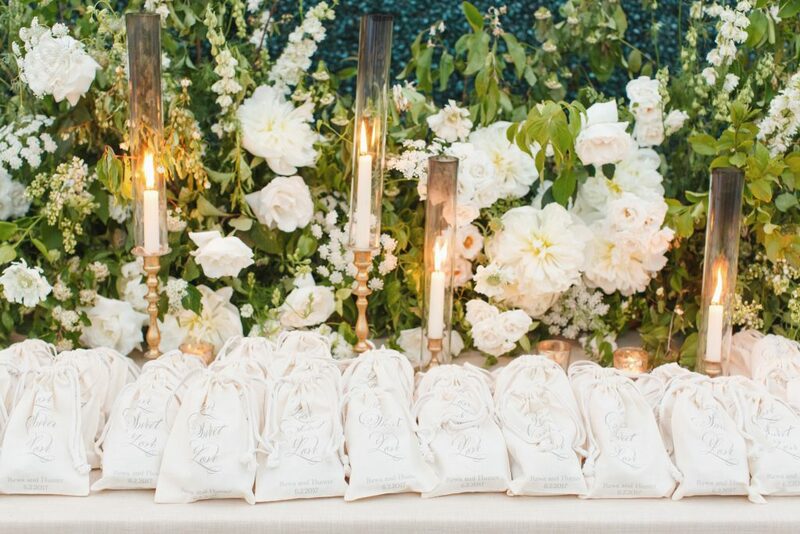 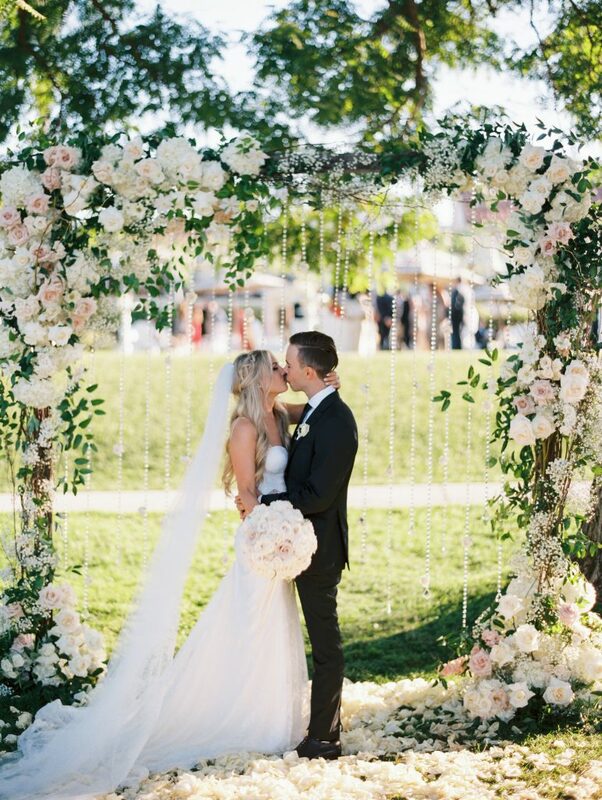 This wedding truly took our breath away. 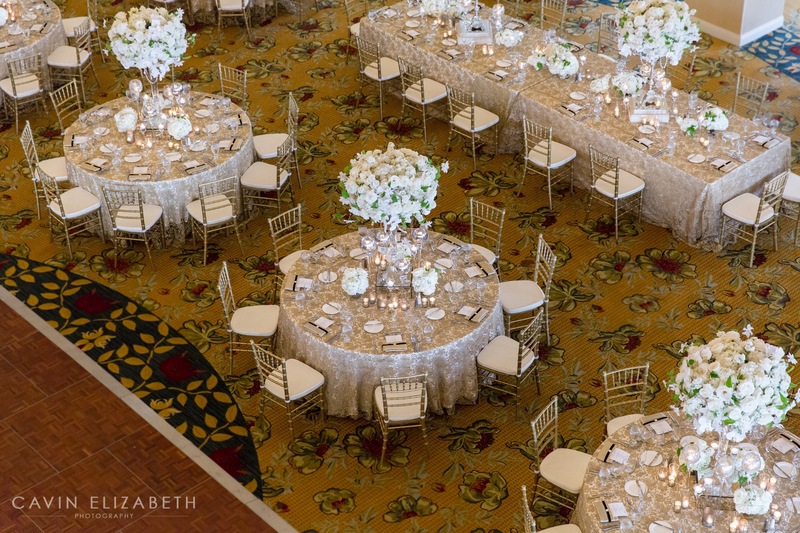 It was POURING rain the day of this dreamy wedding, but you wouldn’t be able to tell from the lovely feel of the ballroom. 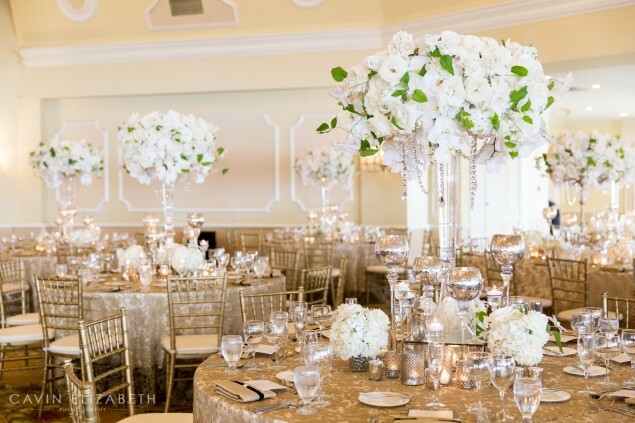 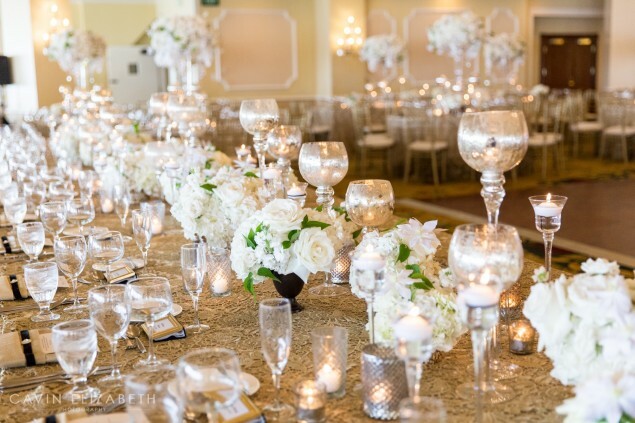 Our fabulous bride Abby came to us with a color scheme of ivory and gold in mind and together, we transformed the large ballroom space at the iconic Hotel Del Coronado into a soft and glamorous wonderland of ivory, cream and light gold with splashes of fresh green and subtle pops of black. 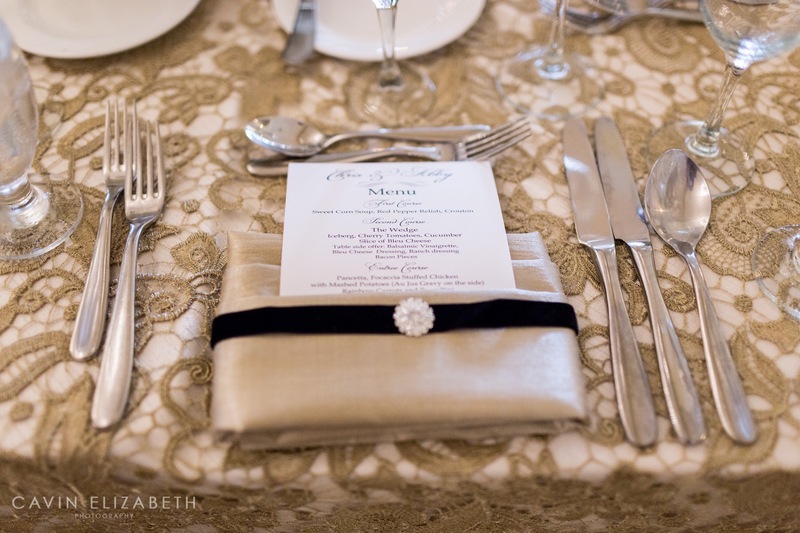 We chose a soft ivory linen topped with a delicate gold lace overlay and paired them with light gold napkins. 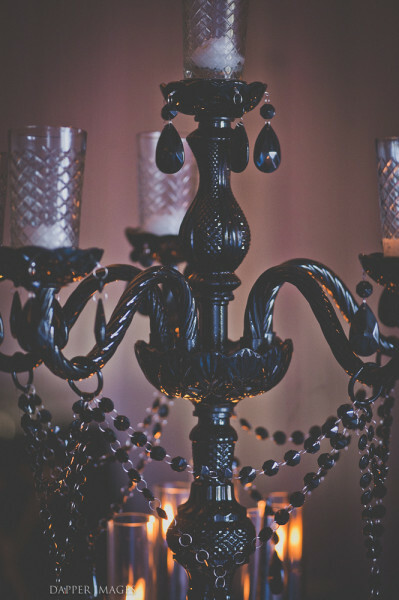 To bring in the black, we designed custom velvet napkin embellishments and subtle candle holder wrapping complete with a rhinestone brooch. 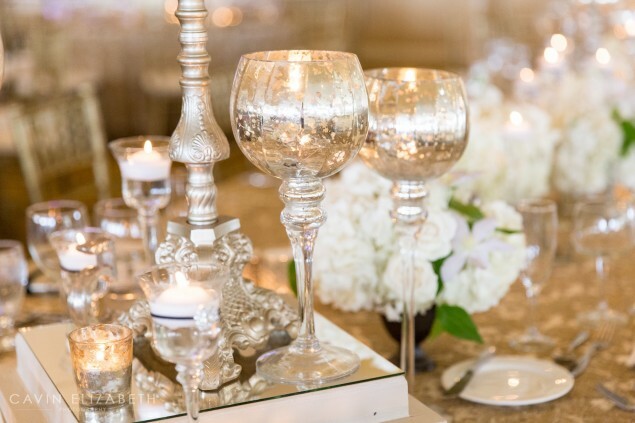 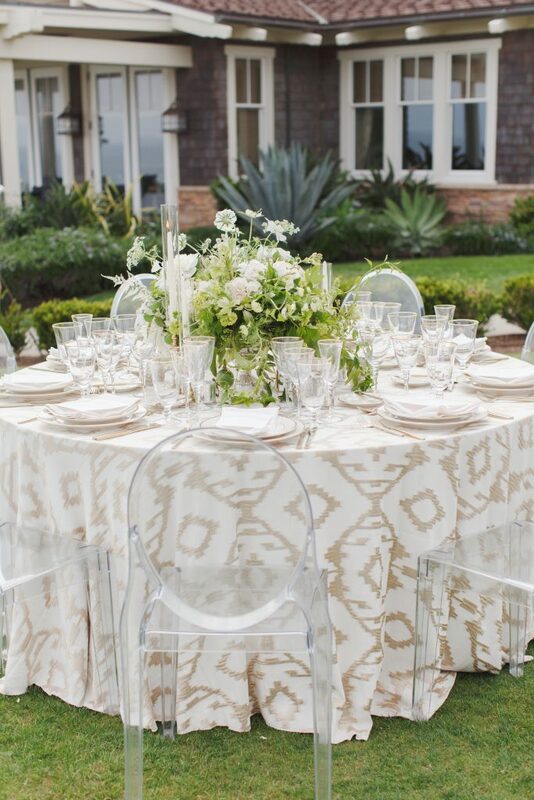 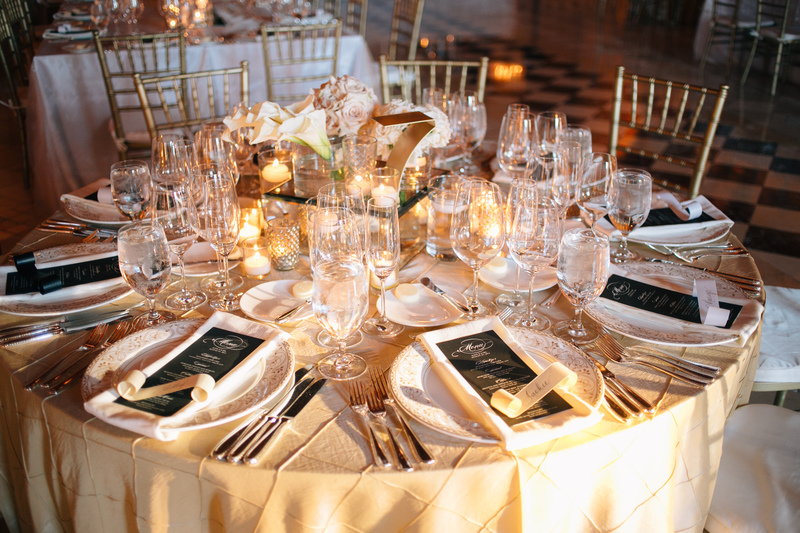 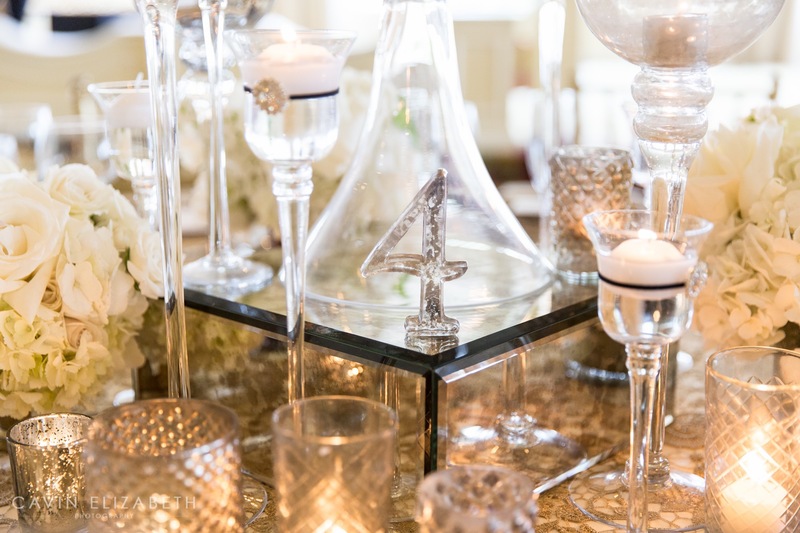 Clusterings of mercury glass, gold and mirrored mediums were paired along the table, adding texture and dimension from candle holders to platforms and vases. 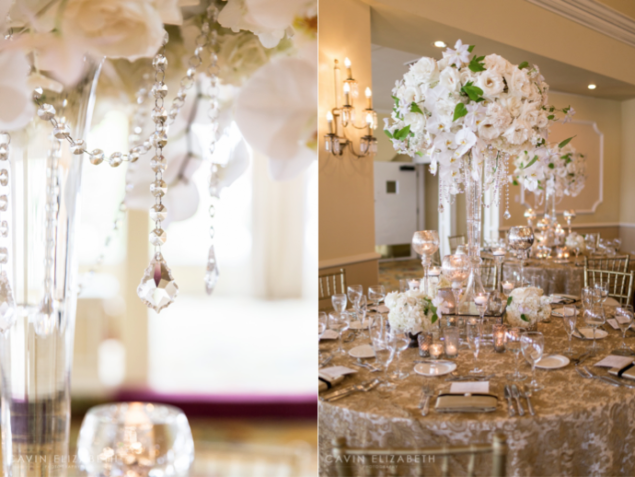 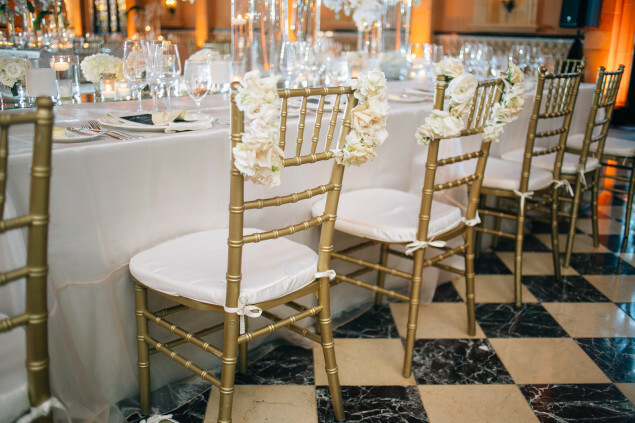 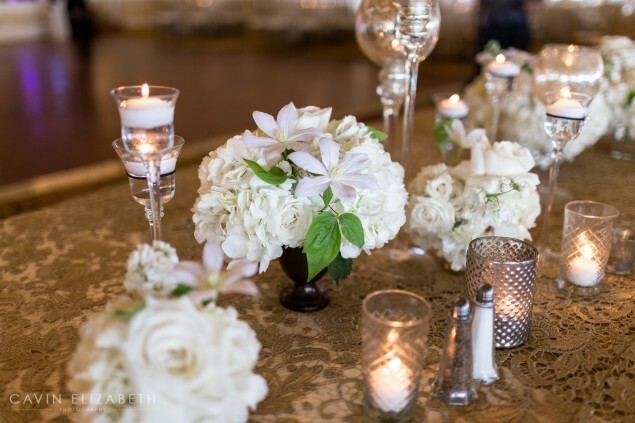 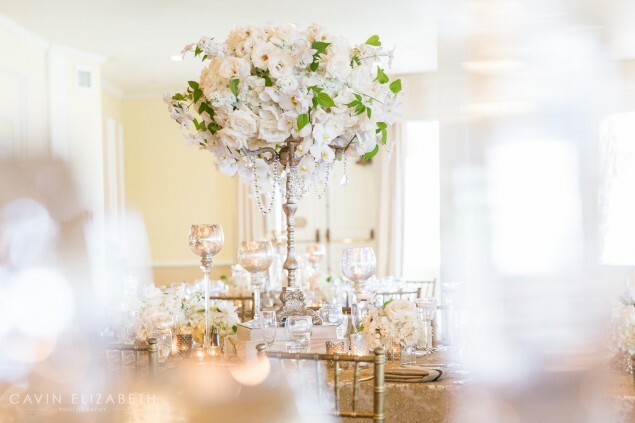 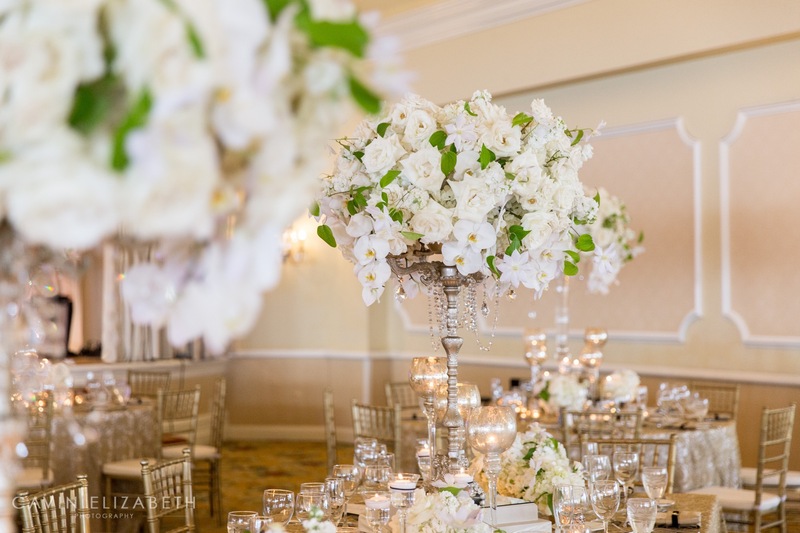 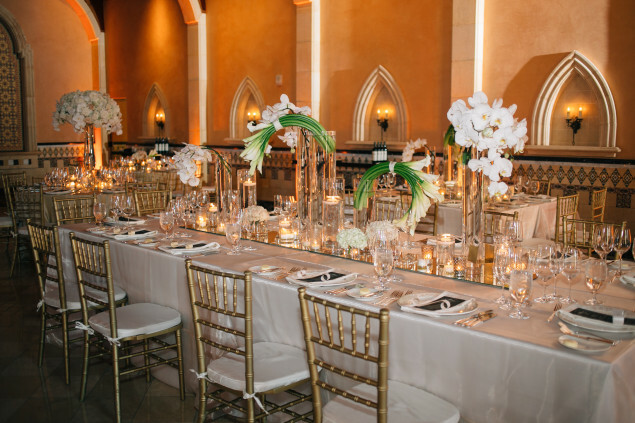 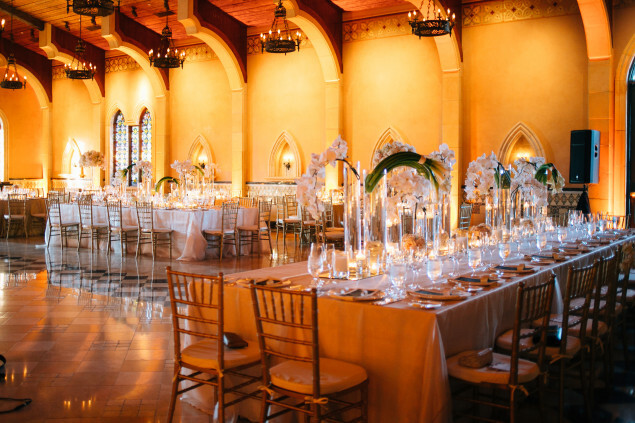 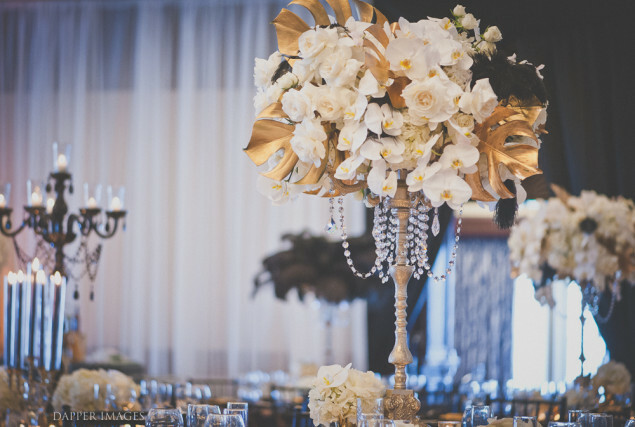 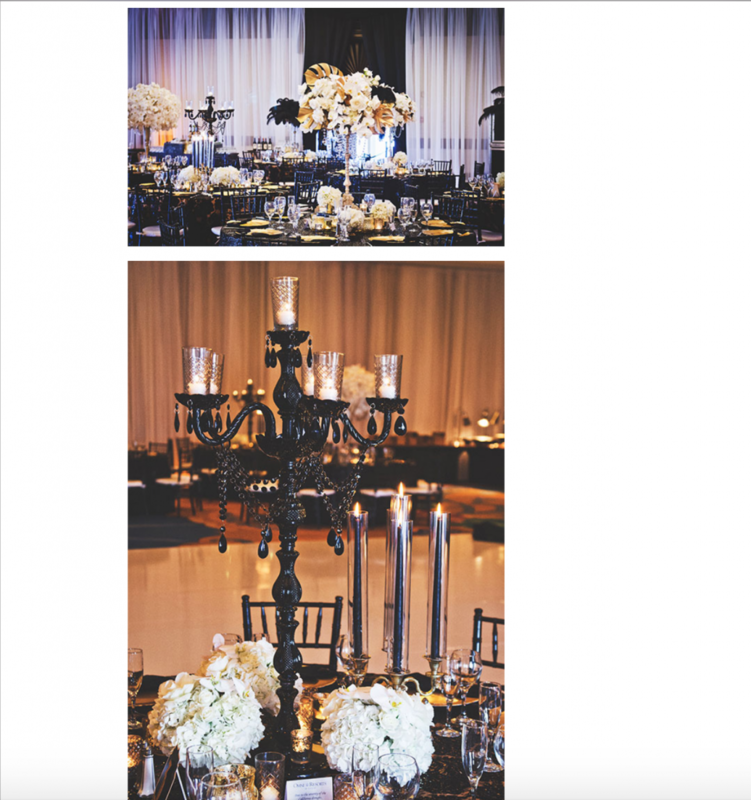 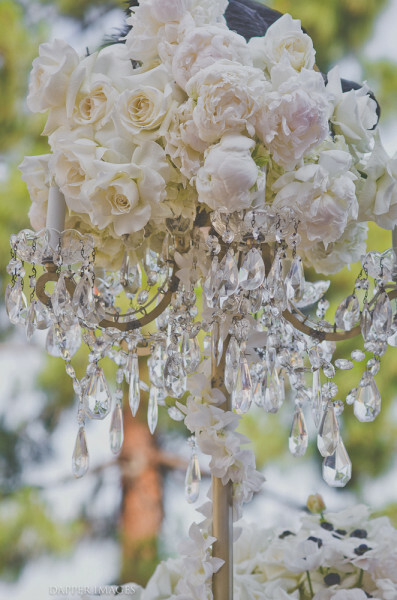 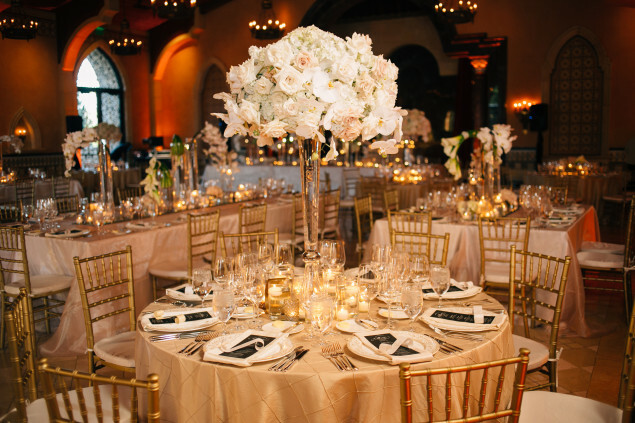 Tall, shaped glass cylinders and regal gold candelabras were accented by dripping crystal pendants and large, lush and loose florals in shades of ivory, cream, white and fresh green. 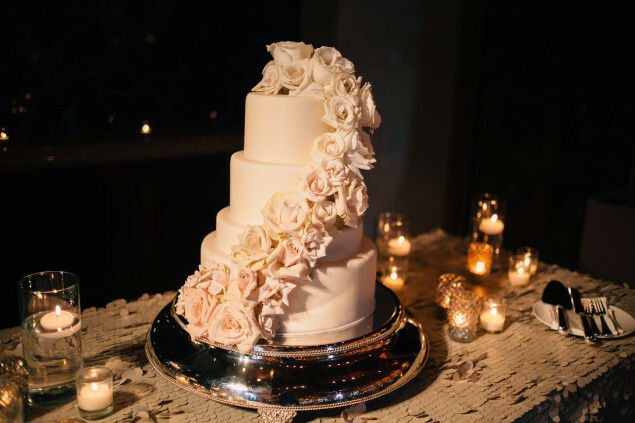 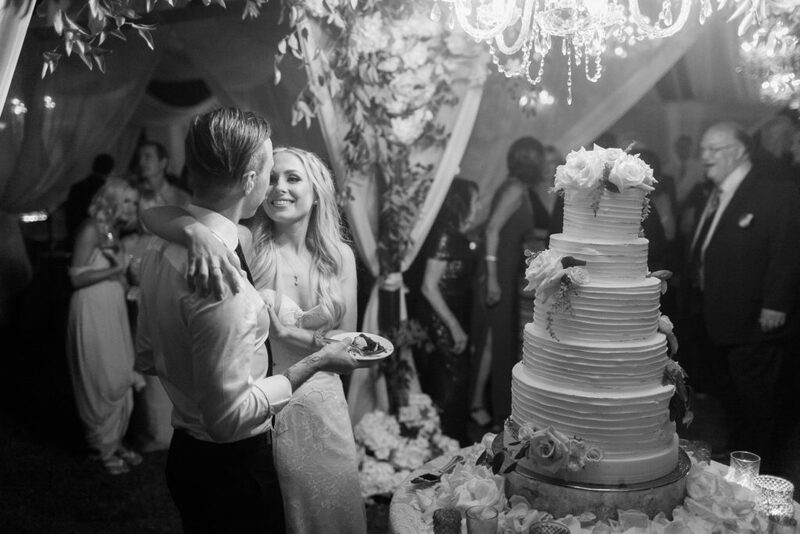 cakes : Sweet Cheeks Baking Co.
To describe this over-the-top wedding as glamorous would be an understatement. 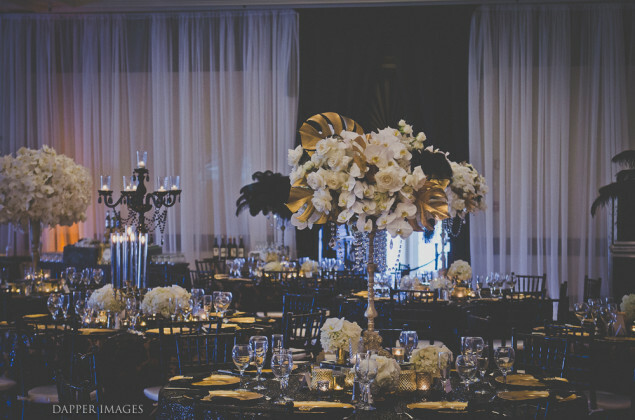 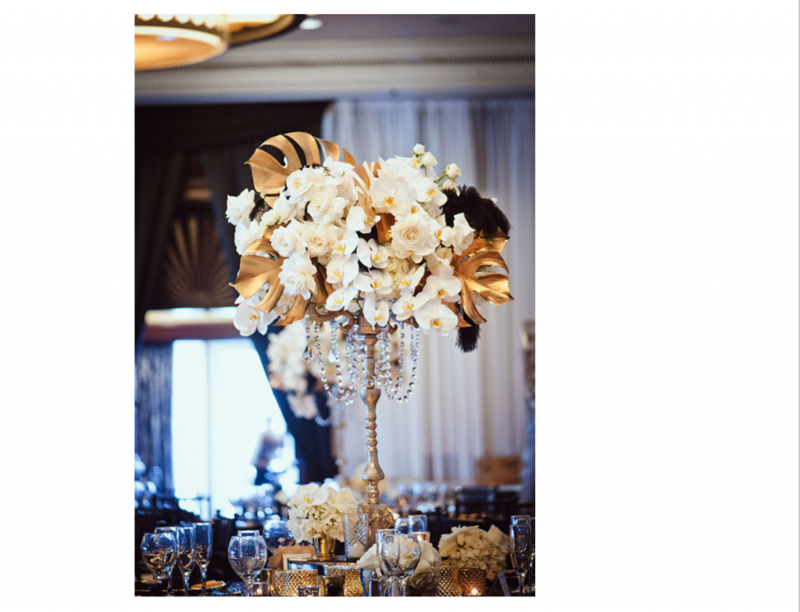 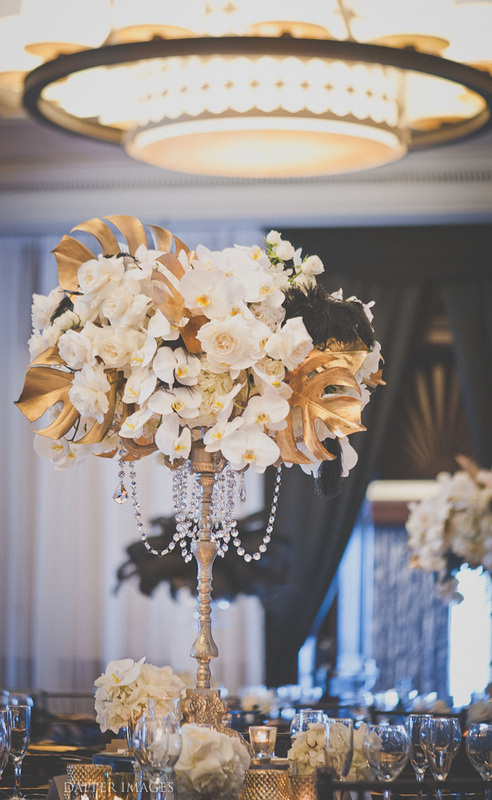 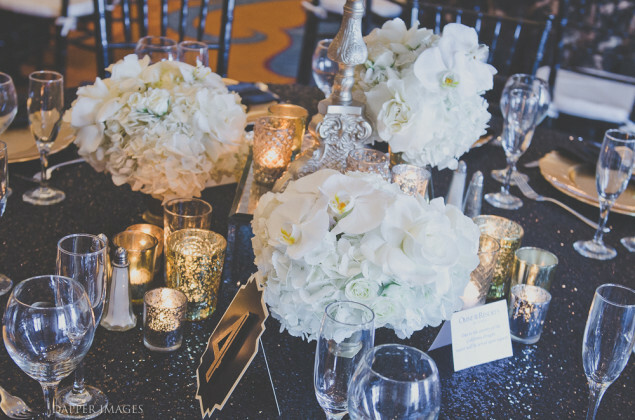 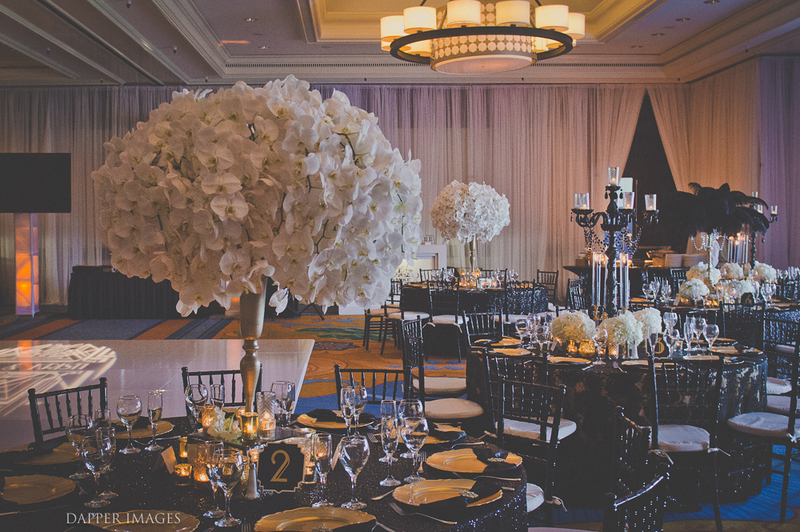 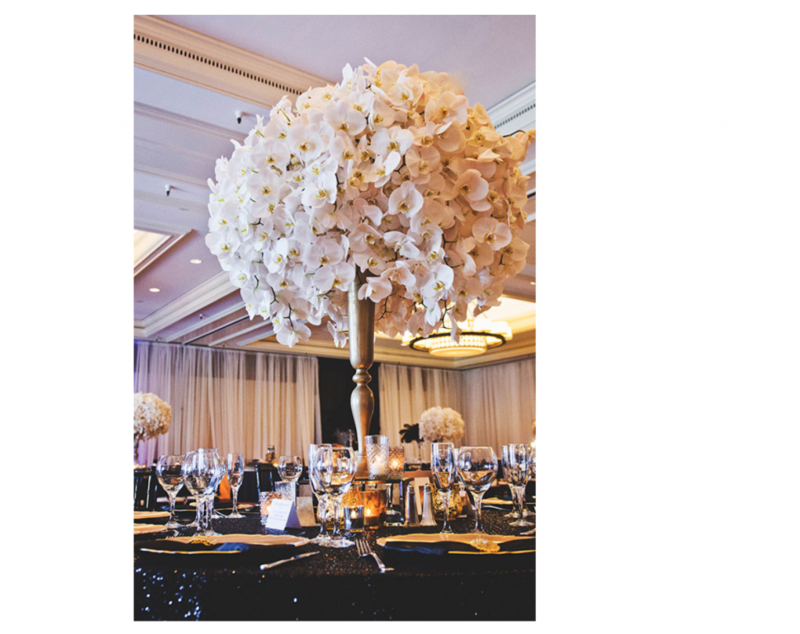 With its numerous chandeliers, glittering crystals, rich golds and shining sequins, this wedding was a shimmering black, white and gold feast for the eyes. 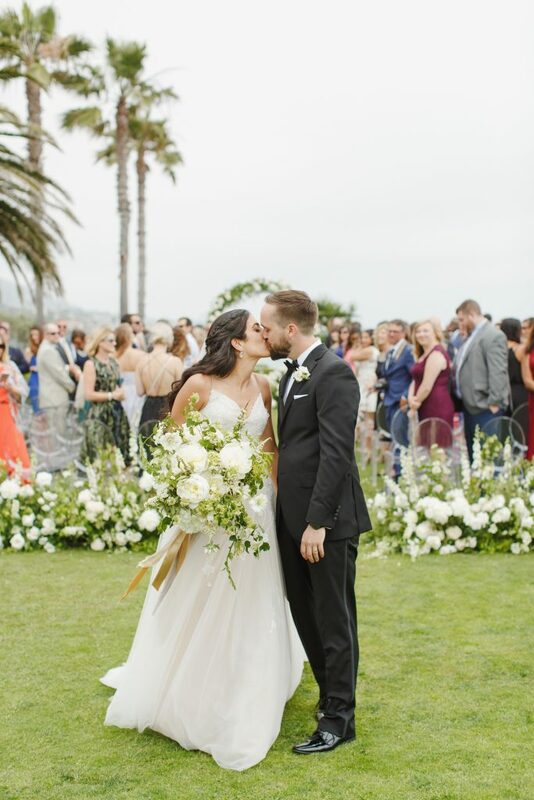 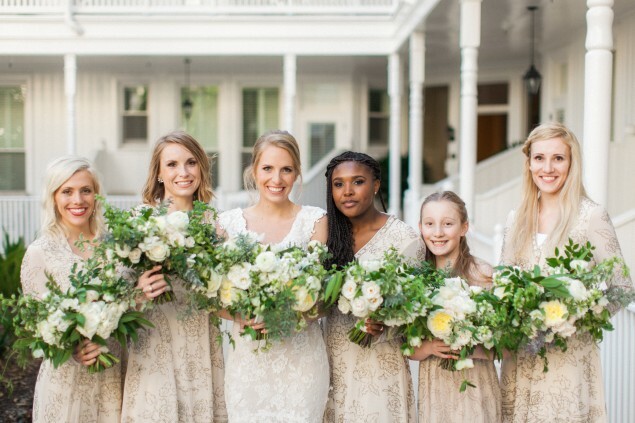 Kristi knew exactly what she wanted from the moment she walked into our studio (along with her FABULOUS wedding coordinator, Gina Hundley of San Diego Weddings by Gina) and we took her dreams and made them into a flower-filled reality. 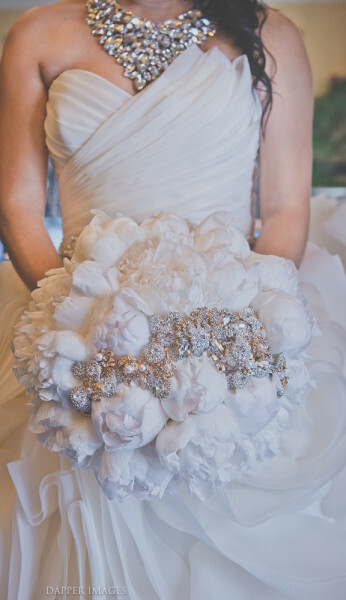 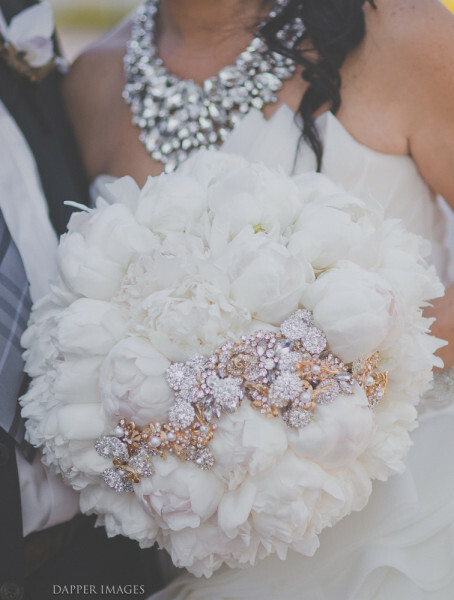 The bridal bouquet truly set the tone, created solely of fluffy, fragrant white peonies encrusted with unique gold-faceted brooches of all shapes and sizes. 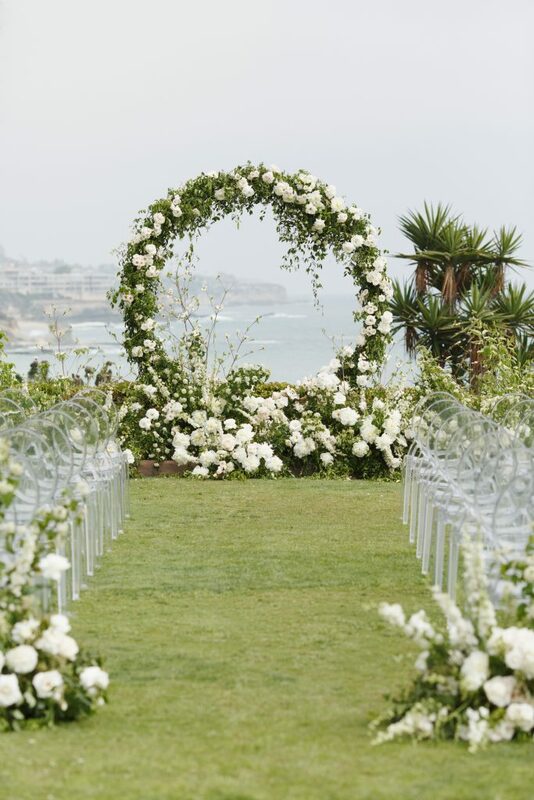 Not to be outdone, the stunning ceremony was dressed-to-the-nines. 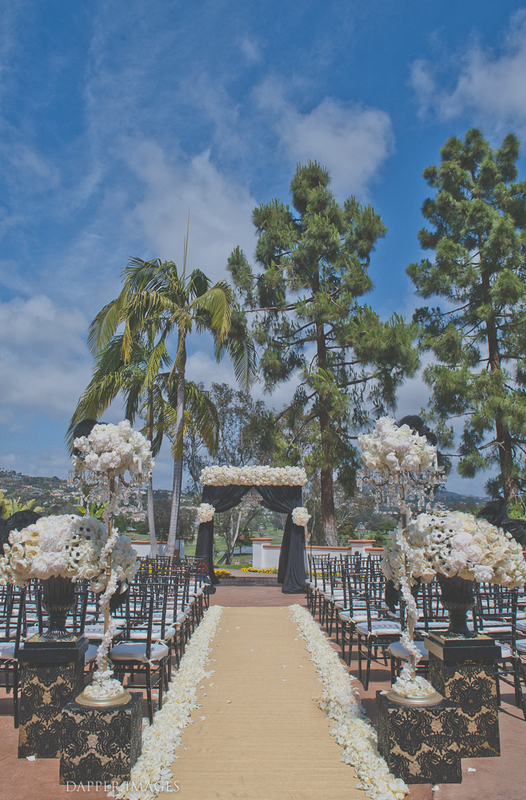 We custom created a gold dupioni silk carpet aisle runner and custom hand-sewn black lace platforms to be topped with floral and surrounded by luxe drama. 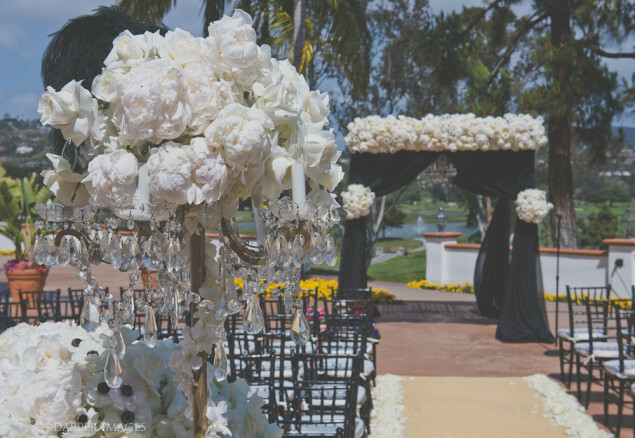 The entry to the aisle was marked by our gold chandeliers, dripping in fluffy peonies and roses paired with large urn-style arrangements of element-blocked florals. We custom created a black draped canopy to be full with a lush floral arrangement across the top. 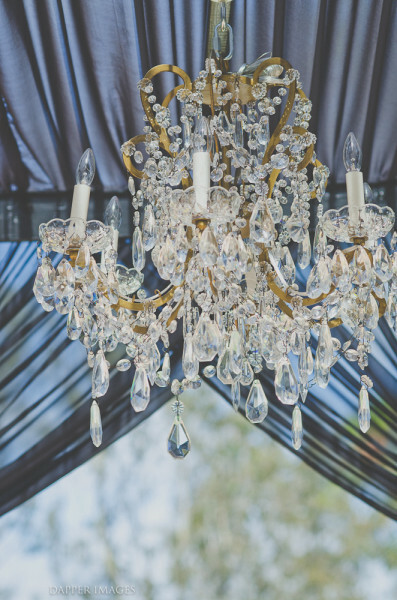 Our glittering gold and crystal chandelier hung in the center, complimenting the entry decor. 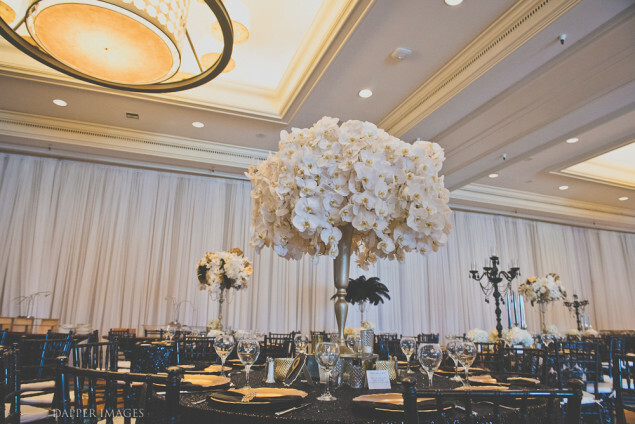 Huge centerpieces covered the reception, with a variety of centerpiece-types placed at guest tables, one more dramatic than the next. 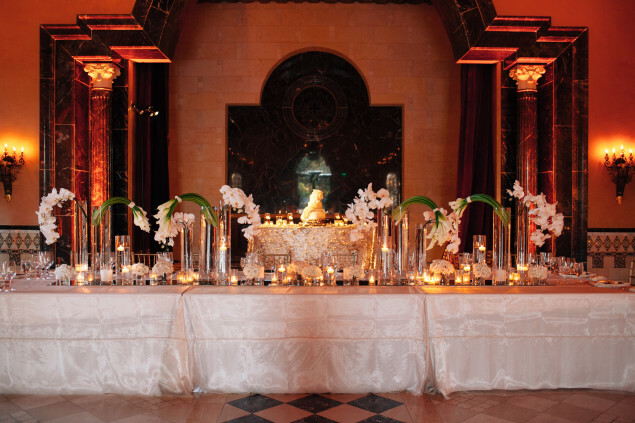 Candles created a romantic glow across the room in shades of glass, cut crystal, gold and mercury glass. Mirrored platforms were utilized to elevate centerpieces and create a unique look on the tabletops. 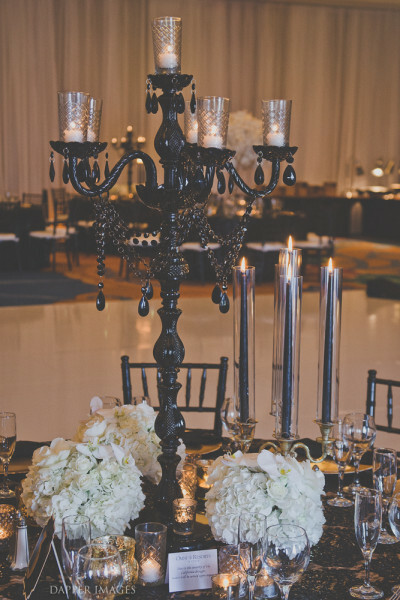 Gold candelabras were adorned with glittering Swarovski crystal detailing and black crystal candelabras were strategically placed along the room to add a unique twist. 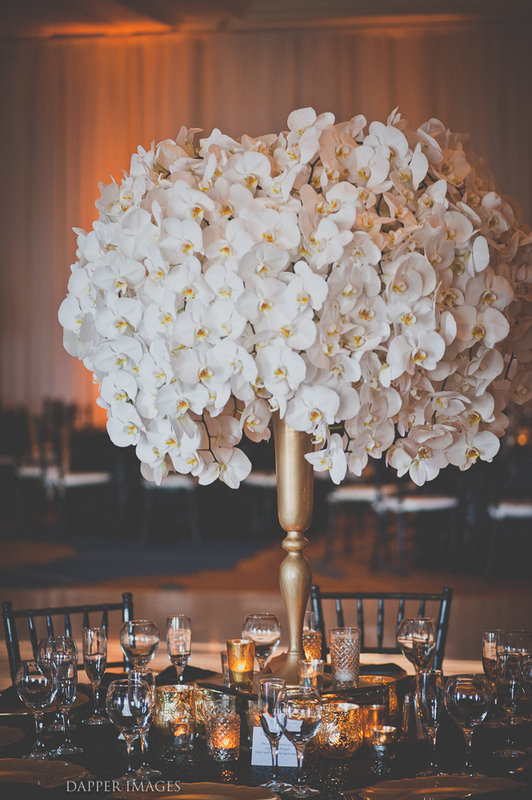 By far the most dramatic and large of the centerpieces was an all-orchid centerpiece created from over 85 exotic phalaenopsis orchid stems. 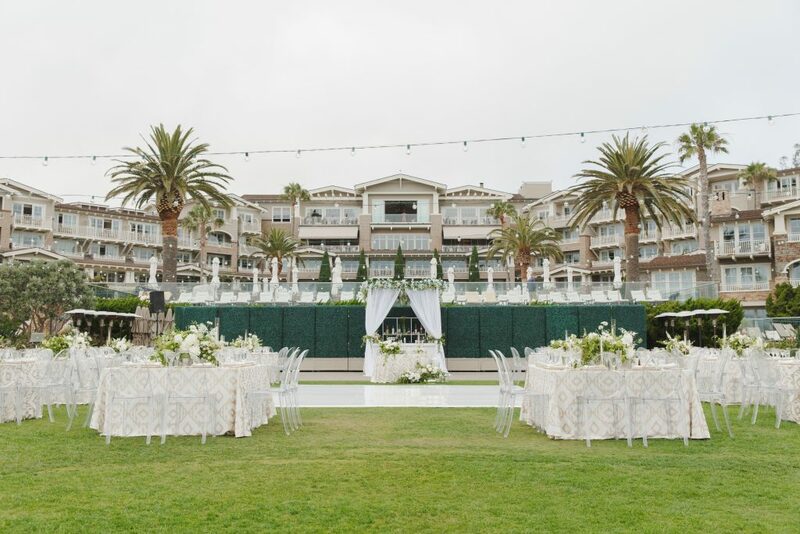 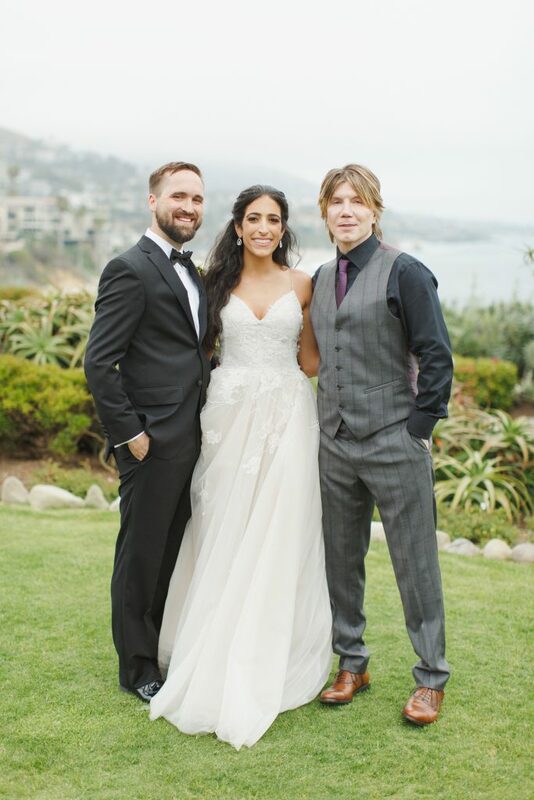 Huge thank you to the team at Dapper Images for the great photos and to San Diego Weddings by Gina for inviting us to play on this amazingly over-the-top wedding! We are always amazed at the talent of Quixotic Weddings ability to perfectly capture not only the magic and beauty of a wedding day, but the emotion and love behind it. 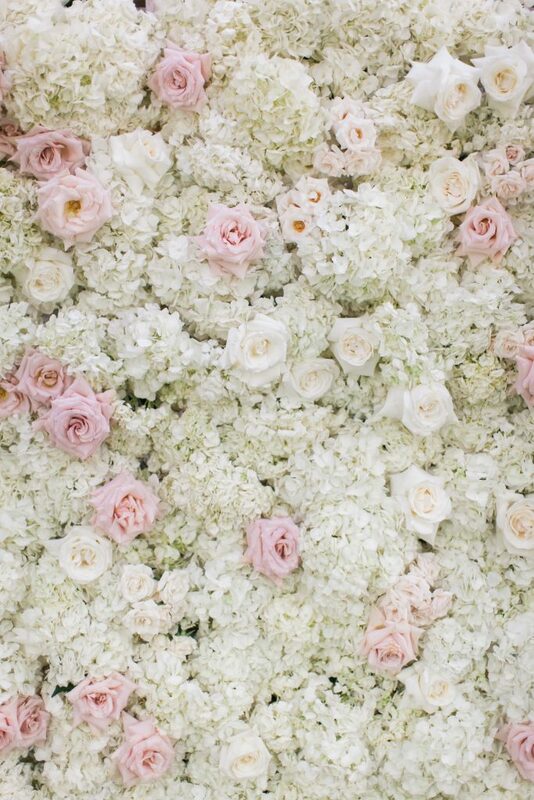 Bravo, once again!!!!! 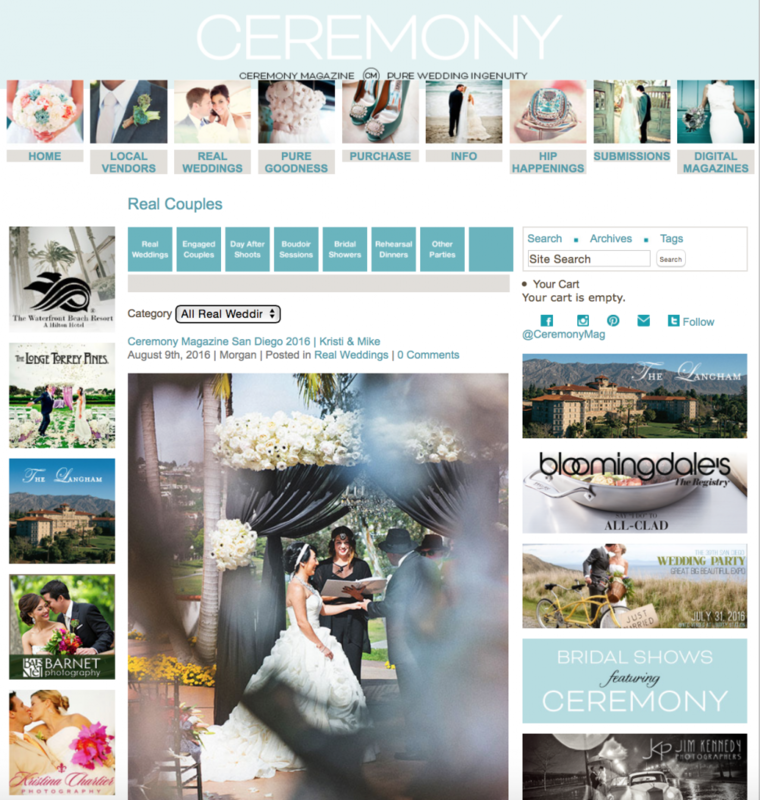 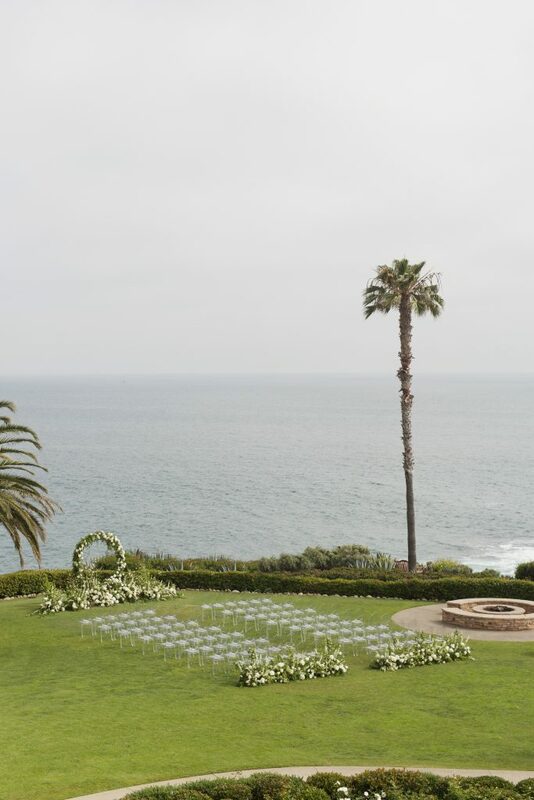 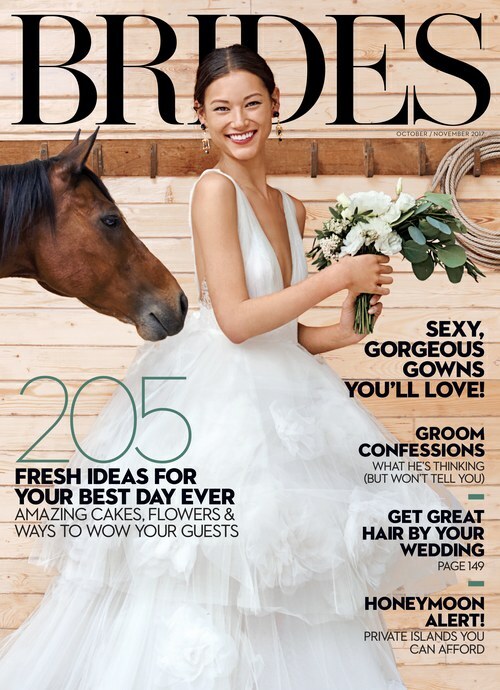 Huge thank you to Crown Weddings for inviting us to be a part of this FABULOUS wedding at the Lodge Torrey Pines! 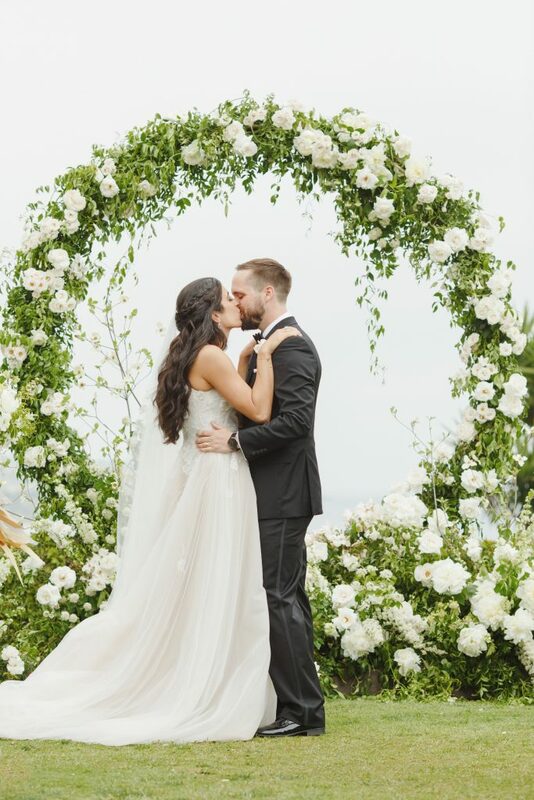 What a day and an honor to be a part of! 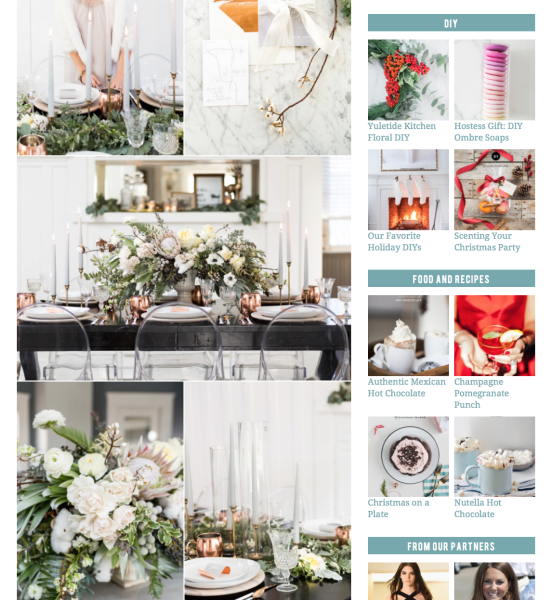 Click here or on the images below to see the entire thing! 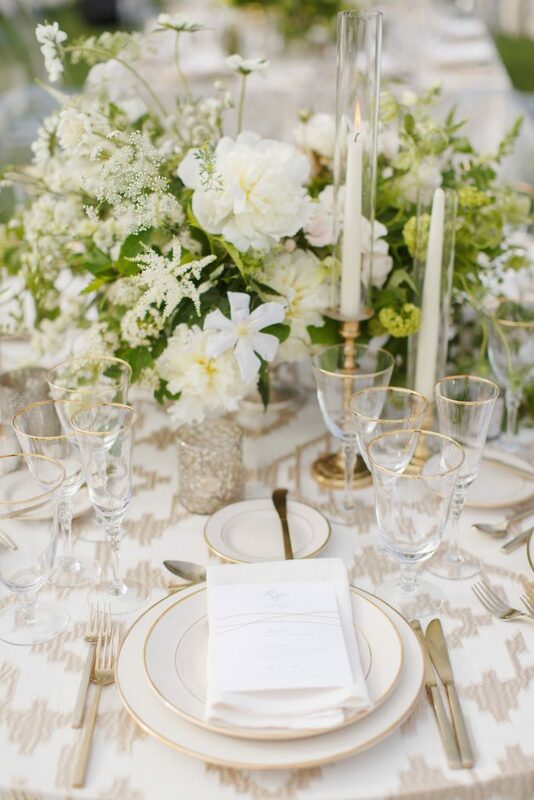 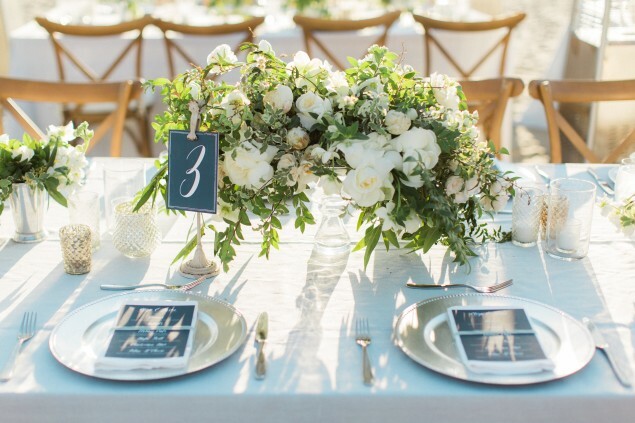 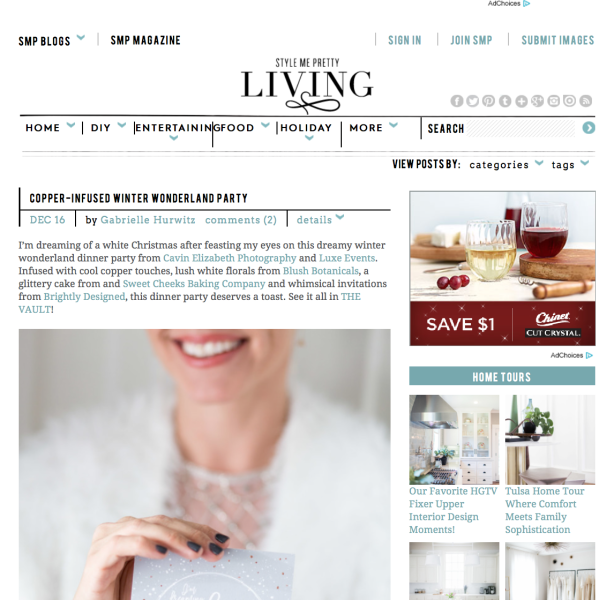 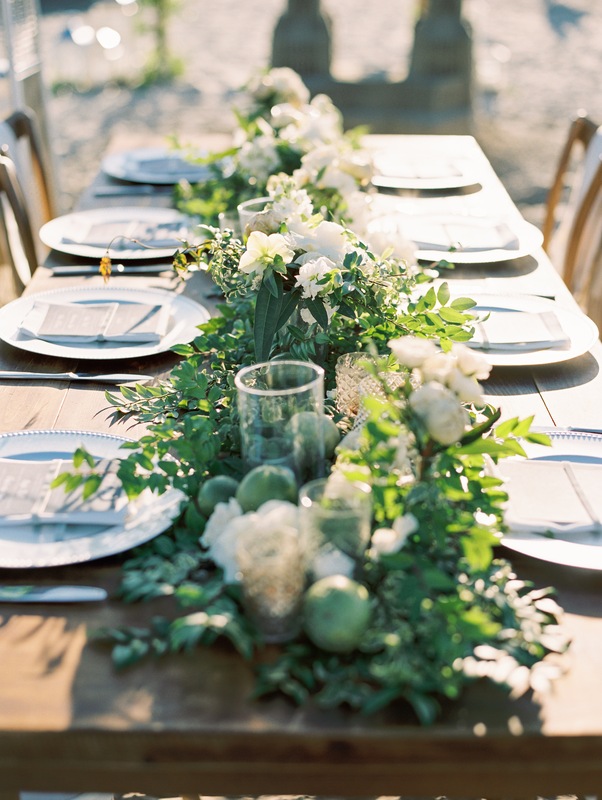 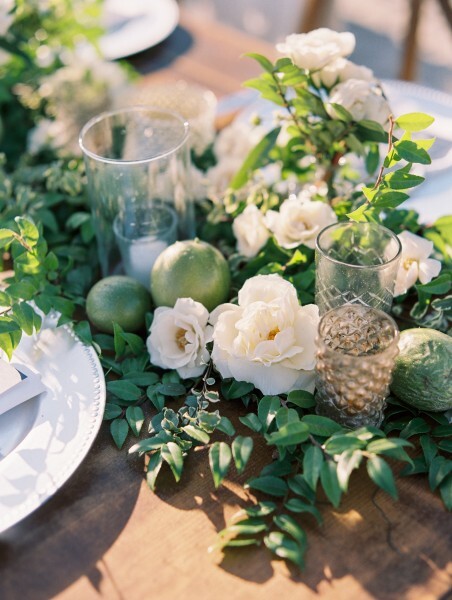 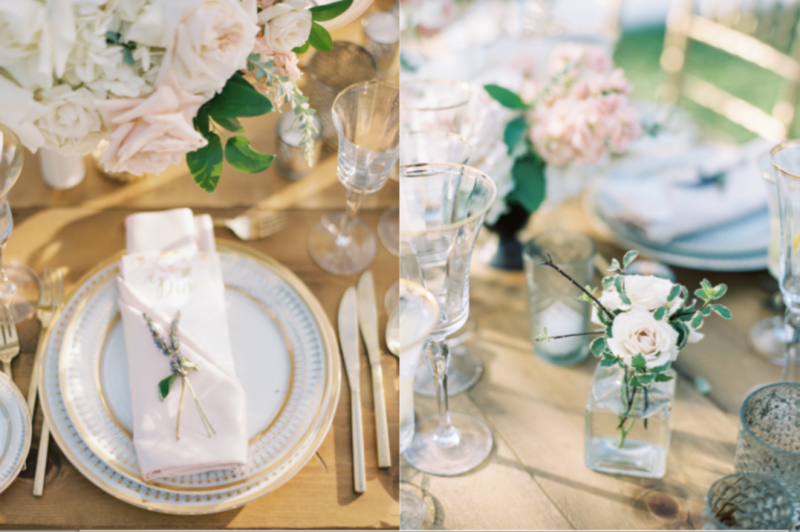 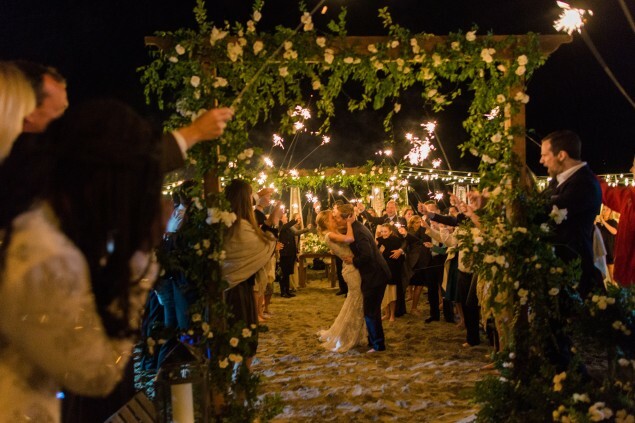 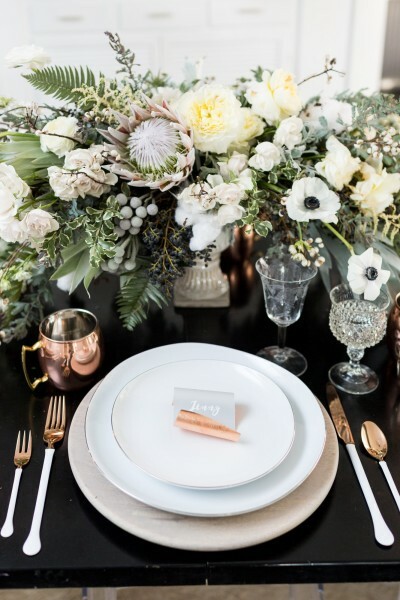 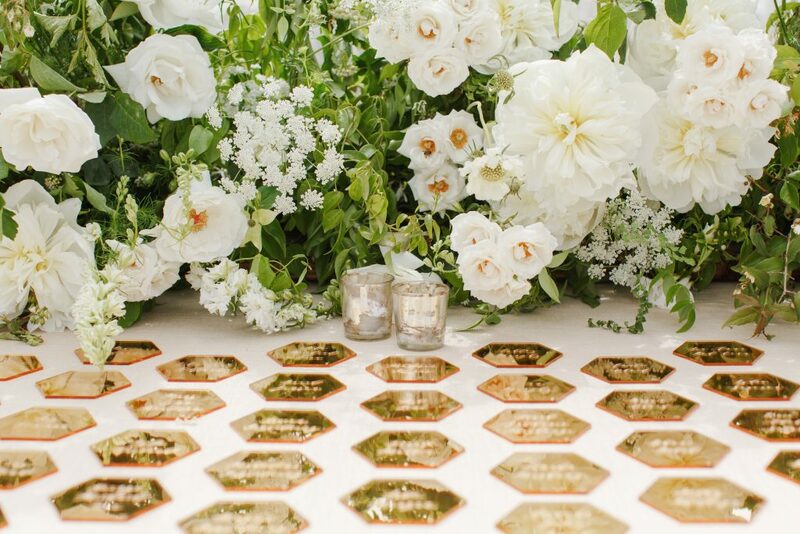 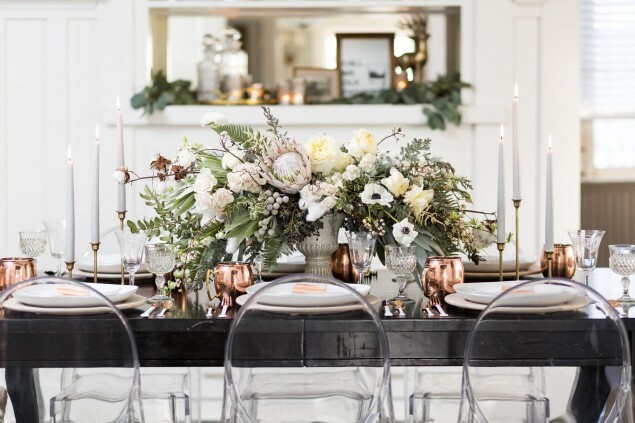 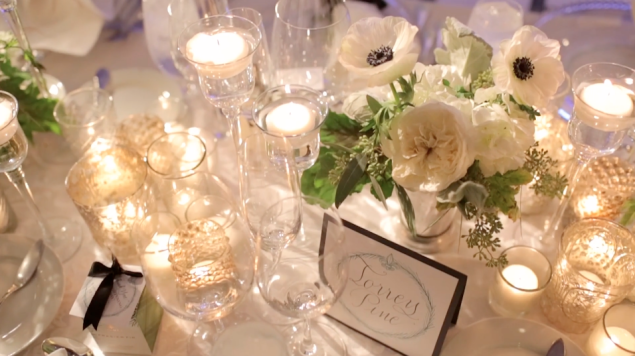 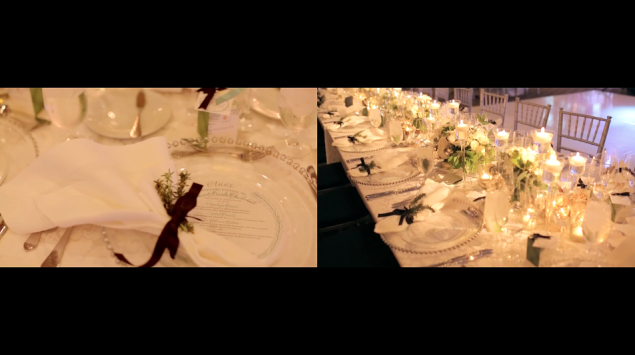 Creating this wedding with Erica Hinshaw of Joie De Vivre Events was pure heaven. 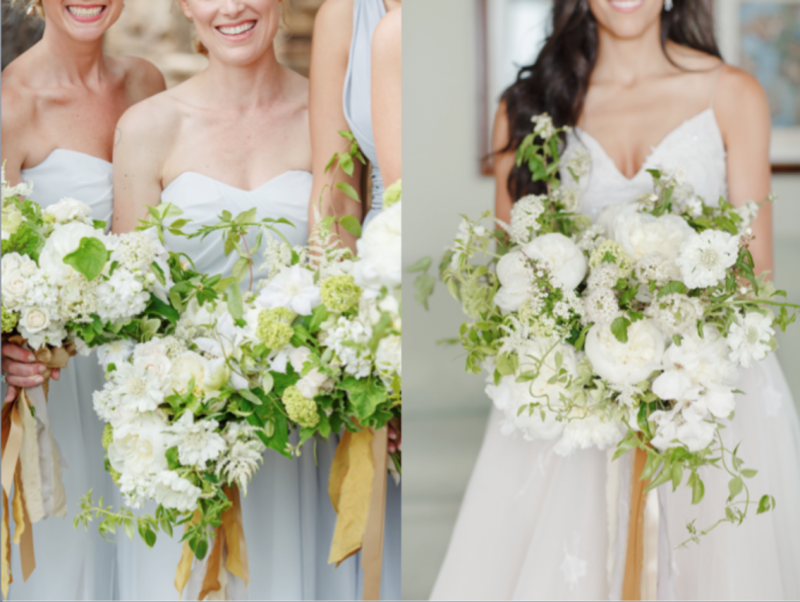 K held a romantic and traditional bridal bouquet created from freesia, roses, spray roses, gardenias and other like blooms while her girls each held a unique bouquet of one type of bloom included in the bridal bouquet against unique gowns. 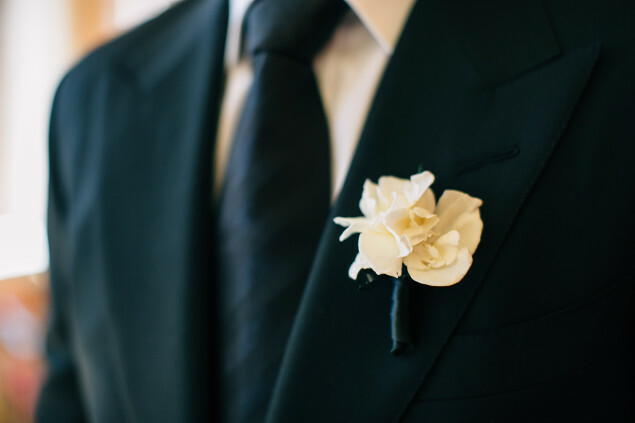 Karl wore a sophisticated and timeless boutonniere created from mini gardenias. 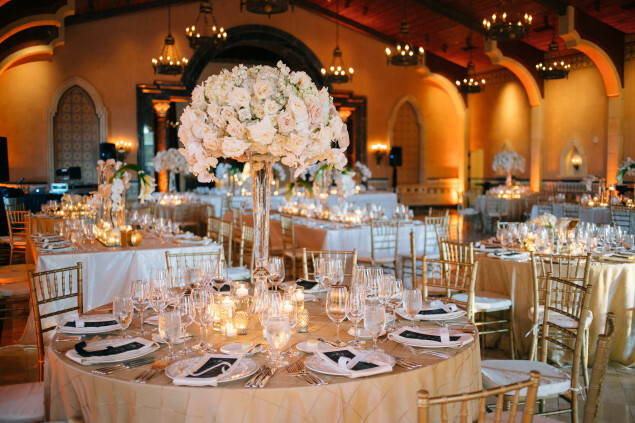 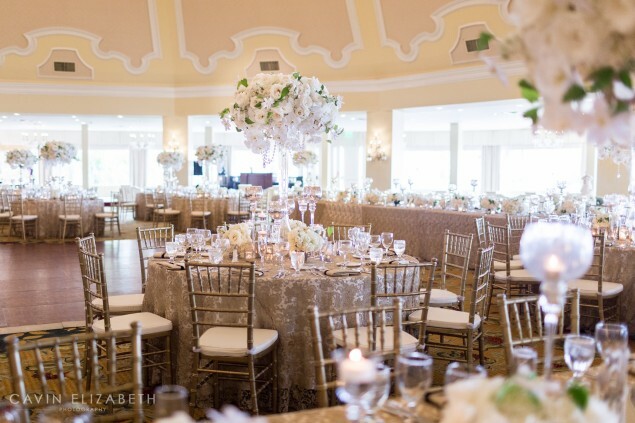 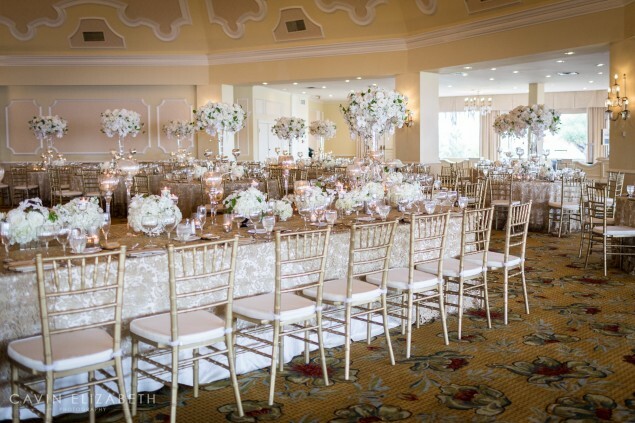 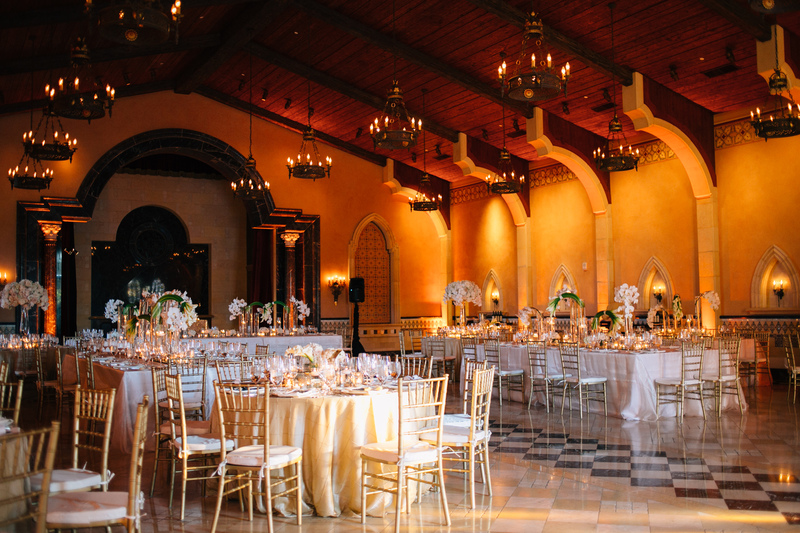 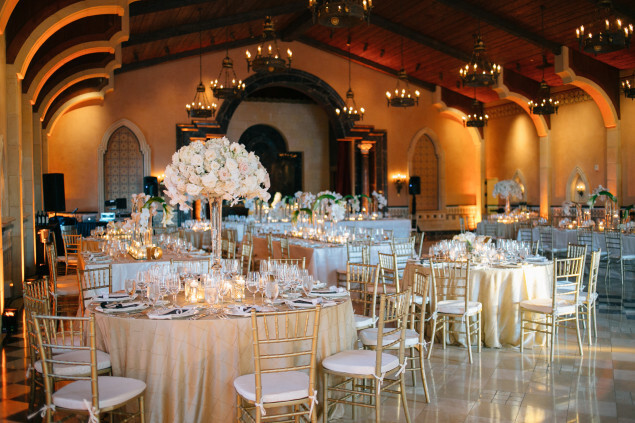 The neutral palette of soft ivories, golds, champagnes and creams paired well with the Capella Ballroom of the Grand Del Mar. 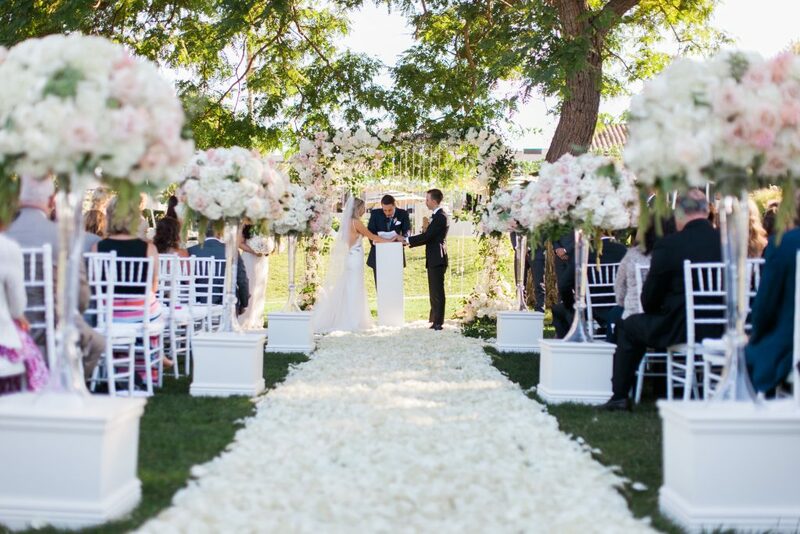 The ceremony was simplicity at its finest, created with tall floral centerpieces placed atop clean ivory pedestals at the entry of the aisle and at the end of the aisle to frame the ceremony. 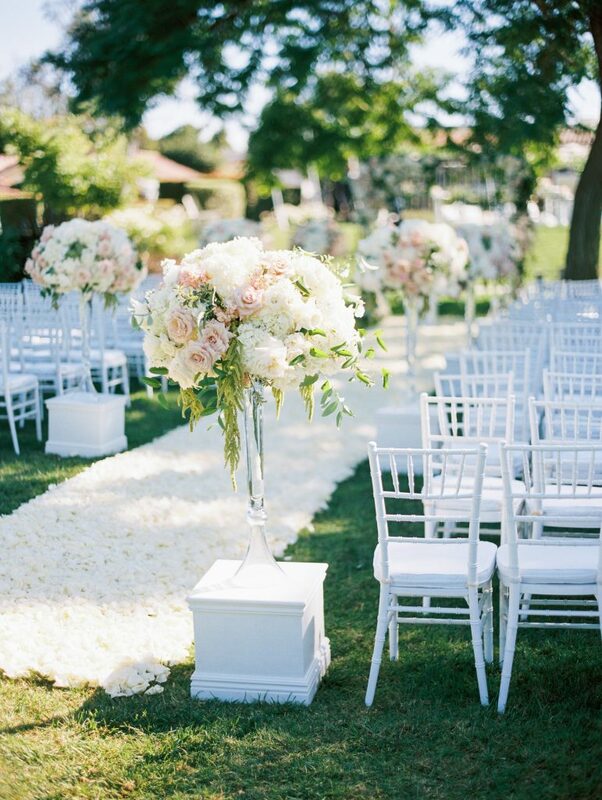 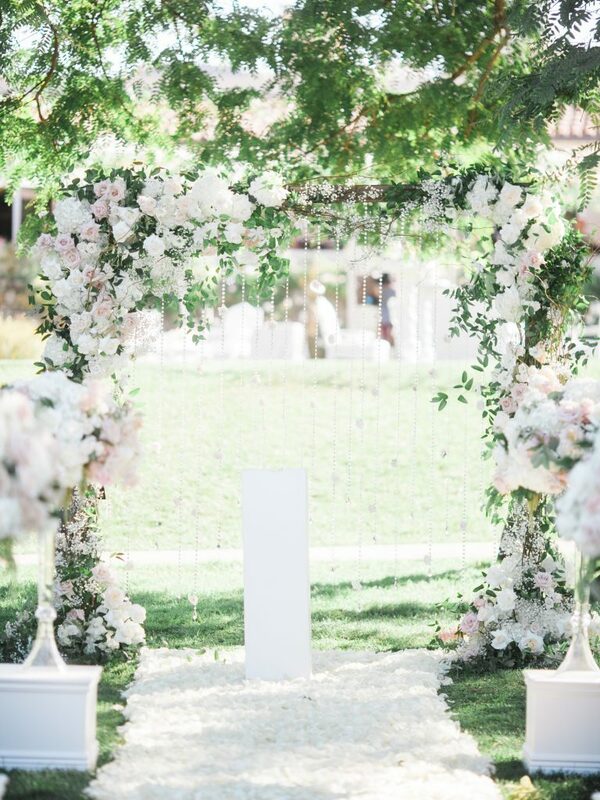 Delicate rose petals lined the aisle sides to soften the scene. The candle-lit reception took place in the gorgeous Capella ballroom of the Grand Del Mar, where we paired various soft ivory, cream and champagne blooms to create a soft look accented by mirrors and gold. 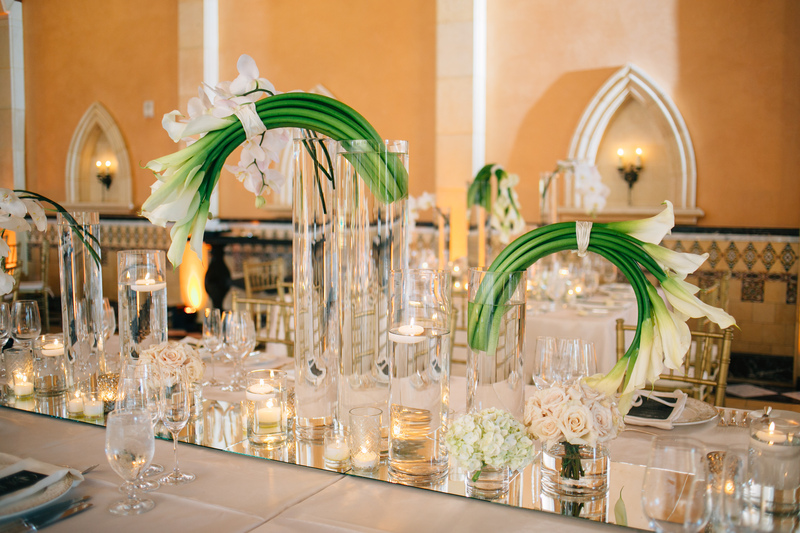 We created mirrored runners down the long banquet tables and hand shaped calla lilies to seem as though they were “spilling” from vessels along with white phalaenopsis orchids.